P. M. Patre, W. MacKunis, K. Dupree, and W. E. Dixon, RISE-Based Robust and Adaptive Control of Nonlinear Systems, Birkhauser: Boston, under contract. R. Kamalapurkar, P. S. Walters, J. 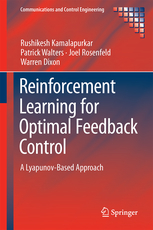 A. Rosenfeld, W. E. Dixon, Reinforcement Learning for Optimal Feedback Control: A Lyapunov-based Approach, Springer, 2018. A. Behal, W. E. Dixon, B. Xian, and D. M. Dawson, Lyapunov-Based Control of Robotic Systems, Taylor and Francis, 2009, ISBN: 0849370256. W. E. Dixon, A. Behal, D. M. Dawson, and S. Nagarkatti, Nonlinear Control of Engineering Systems: A Lyapunov-Based Approach, Birkhauser Boston, 2003, ISBN: 0- 8176-4265-X. Read a review of Nonlinear Control of Engineering Systems: A Lyapunov-Based Approach written by Harris McClamroch that appeared in IEEE Control Systems Magazine, Vol. 25 No. 2, pp. 79,80,88, (April 2005). 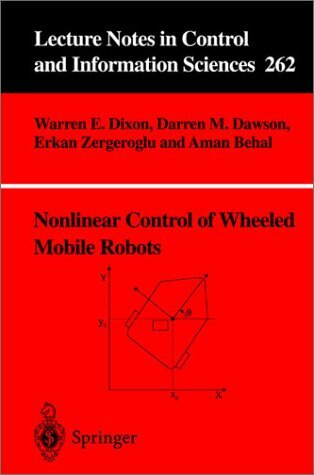 W. E. Dixon, D. M. Dawson, E. Zergeroglu, and A. Behal, Nonlinear Control of Wheeled Mobile Robots, Vol. 262 Lecture Notes in Control and Information Sciences, Springer-Verlag London Ltd, 2000, ISBN: 1-85233-414-2. W. E. Dixon, Section Editor for Autonomous Robotics, Complexity and Nonlinearity, a volume in the Encyclopedia of Complexity and Systems Science , Springer, ISBN: 978-0-387-75888-6. A. Parikh, R. Kamalapurkar, and W. E. Dixon, "Data-Based Learning for Uncertain Robotic Systems" in Adaptive Control for Robotic Manipulators, Edited by D. Zhang and B. Wei, Taylor & Francis Group, pp. 40-48, 2016. R. Kamalapurkar, P. Walters, and W.E. Dixon "Model-Based Reinforcement Learning for Approximate Optimal Regulation," in Control of Complex Systems: Theory and Applications, Edited by K. G. Vamvoudakis and S. Jagannathan, Butterworth-Heinemann: Elsevier, pp. 247-273, 2016. R. Downey, R. Kamalapurkar, N. Fischer, and W. E. Dixon "Compensating for Fatigue-Induced Time-Varying Delayed Muscle Response in Neuromuscular Electrical Stimulation Control," in Recent Results on Nonlinear Delay Control Systems: In honor of Miroslav Krstic, Edited by I. Karafyllis, M. Malisoff, F. Mazenc, P. Pepe, Springer, pp. 143-161, 2015. Z. Kan, J. M. Shea, W. E. Dixon, "Navigation Function Based Decentralized Control of A Multi-Agent System with Network Connectivity Constraints," in Examining Robustness and Vulnerability of Networked Systems, Edited by S. Butenko, E. L. Pasiliao, V. Shylo, NATO Science for Peace and Security Series - D: Information and Communication Security, Vol 35, pp. 104-119, 2014. L. Navaravong, J. M. Shea, E. L. Pasiliao, G. Barnette and W. E. Dixon, "Optimizing Network Topology to Reduce Aggregate Traffic in Systems of Mobile Agents," in Models, Algorithms, and Technologies for Network Analysis, Edited by B. Goldengorin and V. A. Kalyagin and P. M. Pardalos, Springer New York, Springer Proceedings in Mathematics & Statistics, Vol. 32, pp. 129-149, 2013. S. Bhasin, R. Kamalapurkar, M. Johnson, K. G. Vamvoudakis, F. L. Lewis, and W. E. Dixon, "An Actor-Critic-Identifier Architecture for Adaptive Approximate Optimal Control," in Reinforcement Learning and Approximate Dynamic Programming for Feedback Control, Edited by F. L. Lewis and D. Liu, Wiley and IEEE Press, New Jersey, pp. 258-278, IEEE Press Series on Computational Intelligence, 2013. S. Subramanian, E. L. Pasiliao, J. M. Shea, J. W. Curtis, and W. E. Dixon, "Throughput Maximization in CSMA Networks with Collisions and Hidden Terminals," in Dynamics of Information Systems: Mathematical Foundations, Edited by A. Sorokin, R. Murphey, M. T. Thai, and P. M. Pardalos, Springer, pp. 195-206, 2012. A. P. Dani, Z. Kan, N. Fischer, and W. E. Dixon, "Real-time Structure and Motion Estimation in Dynamic Scenes using a Single Camera," in Robotic Vision: Technologies for Machine Learning and Vision Applications, Edited by J. Garcia-Rodriguez and M. C. Quevedo, IGI Global Publication, pp. 173-191, July 12, 2012. A. Dani and W. E. Dixon, "Single Camera Structure and Motion Estimation" in Visual Servoing via Advanced Numerical Methods, Edited by G. Chesi and K. Hashimoto, Springer, Lecture Notes in Control and Information Sciences Volume 401, 2010, pp. 209-229. S. Mehta, G. Hu, N. Gans, and W. E. Dixon, " A Daisy-Chaining Visual Servoing Approach with Applications in Tracking, Localization, and Mapping," in Robot Localization and Map Building, Chapter 20, pp. 383-408, Edited by Hanafiah Yussof, ISBN: 978-953-7619-83-1, InTech, March 2010. W. E. Dixon, "Introduction to Complexity and Nonlinearity in Autonomous Robotics" in Autonomous Robotics, Complexity and Nonlinearity, a volume in the Encyclopedia of Complexity and Systems Science , Springer, pp. 1224-1226, Vol. 2, 2009, ISBN: 978-0-387-75888-6. G. Hu, N. Gans, and W. E. Dixon, "Adaptive Visual Servo Control" in Autonomous Robotics, Complexity and Nonlinearity, a volume in the Encyclopedia of Complexity and Systems Science , Springer, pp. 42-63, Vol. 1, 2009, ISBN: 978-0-387-75888-6. N. Gans, G. Hu, and W. E. Dixon, "Image-Based State Estimation" in Autonomous Robotics, Complexity and Nonlinearity, a volume in the Encyclopedia of Complexity and Systems Science , Springer, pp. 4751-4776, Vol. 5, 2009, ISBN: 978-0-387-75888-6. S. Bhasin, K. Dupree and W. E. Dixon, "Control of Robotic Systems Undergoing a Non-Contact to Contact Transition" in Robot Manipulators, Edited by M. Ceccarelli, In-Tech, pp. 113-136, 2008, ISBN: 978-953-7619-06-0. C. A. Cousin, C. A. Rouse, V. H. Duenas, and W. E. Dixon, "Controlling the Cadence and Admittance of a Functional Electrical Stimulation Cycle," IEEE Transactions on Neural Systems and Rehabilitation Engineering, to appear. R. Licitra, Z. Bell, and W. E. Dixon, "Single Agent Indirect Herding of Multiple Targets with Unknown Dynamics," IEEE Transactions on Robotics, to appear. J. A. Rosenfeld, S. A. Rosenfeld, and W. E. Dixon, "A Mesh-free Pseudospectral Approach to Estimating the Fractional Laplacian via Radial Basis Functions," Journal Of Computational Physics, to appear. H.-Y. Chen, Z. Bell, P. Deptula, and W. E. Dixon, "A Switched Systems Approach to Path Following with Intermittent State Feedback," IEEE Transactions on Robotics, to appear. Z. Bell, J. Nezvadovitz, A. Parikh, E. Schwartz, and W. E. Dixon, "Global Exponential Tracking Control for an Autonomous Surface Vessel: An Integral Concurrent Learning Approach," IEEE Journal of Oceanic Engineering, to appear. V. H. Duenas, C. A. Cousin, C. Rouse, E. J. Fox, and W. E. Dixon, "Distributed Repetitive Learning Control for Cooperative Cadence Tracking in Functional Electrical Stimulation Cycling," IEEE Transactions on Cybernetics, to appear. A. Parikh, R. Kamalapurkar, and W. E. Dixon, "Integral Concurrent Learning: Adaptive Control with Parameter Convergence using Finite Excitation," International Journal of Adaptive Control and Signal Processing, to appear. J. A. Rosenfeld, R. Kamalapurkar, and W. E. Dixon, "The State Following (StaF) Approximation Method," IEEE Transactions on Neural Networks and Learning Systems, to appear. Z. Kan, E. Doucette, and W. E. Dixon, "Distributed Connectivity Preserving Target Tracking with Random Sensing," IEEE Transactions on Automatic Control, to appear. V. Ghanbari, V. H. Duenas, P. J. Antsaklis, and W. E. Dixon, "Passivity-Based Iterative Learning Control for Cycling Induced by Functional Electrical Stimulation with Electric Motor Assistance," IEEE Transactions on Control Systems Technology, to appear. V. H. Duenas, C. A. Cousin, A. Parikh, P. Freeborn, E. J. Fox, and W. E. Dixon, "Motorized and Functional Electrical Stimulation Induced Cycling via Switched Repetitive Learning Control," IEEE Transactions on Control Systems Technology, to appear. H. Kawai, M. Bellman, R. Downey, and W. E. Dixon, "Closed-Loop Position and Cadence Tracking Control for FES-Cycling Exploiting Pedal Force Direction with Antagonistic Bi-Articular Muscles," IEEE Transactions on Control Systems Technology, Vol. 27, No. 2, pp. 730-742 (2019). K. G. Vamvoudakis, F. L. Lewis, and W. E. Dixon, "Open-Loop Stackelberg Learning Solution for Hierarchical Control Problems," International Journal of Adaptive Control and Signal Processing, Vol. 33, No. 2, pp. 285-299 (2019). R. Kamalapurkar, J. A. Rosenfeld, A. Parikh, A. R. Teel, and W. E. Dixon, "Invariance-like Results for Nonautonomous Switched Systems," IEEE Transactions on Automatic Control, Vol. 64, No. 2, pp. 614-627 (2019). A. Parikh, T.-H. Cheng, R. Licitra, and W. E. Dixon, "A Switched Systems Approach to Image-Based Localization of Targets that Temporarily Leave the Camera Field of View," IEEE Transactions on Control Systems Technology, Vol. 26, No. 6, pp. 2149-2156 (2018). H.-Y. Chen, Z. I. Bell, P. Deptula, and W. E. Dixon, "A Switched Systems Framework for Path Following with Intermittent State Feedback," IEEE Control Systems Letters, Vol. 2, No. 4, pp. 749-754 (2018). Z. Kan, S. Mehta, J. Shea, J. W. Curtis, and W. E. Dixon, "Balanced Containment Control and Cooperative Timing of a Multi-Agent System over Random Communication Graphs," International Journal of Robust and Nonlinear Control, Vol. 28, No. 11, pp. 3574-3588 (2018). A. Parikh, R. Kamalapurkar, and W. E. Dixon, "Target Tracking in the Presence of Intermittent Measurements via Motion Model Learning," IEEE Transactions on Robotics, Vol. 34, No. 3, pp. 805-819 (2018). P. Deptula, J. Rosenfeld, R. Kamalapurkar, and W. E. Dixon, "Approximate Dynamic Programming: Combining Regional and Local State Following Approximations," IEEE Transactions on Neural Networks and Learning Systems, Vol. 29, No. 6, pp. 2154-2166 (2018). J. A. Rosenfeld, B. Russo, and W. E. Dixon, "The Mittag Leffler Reproducing Kernel Hilbert Spaces of Entire and Analytic Functions," Journal of Mathematical Analysis and Applications, Vol. 463, No. 2, pp. 576-592 (2018). P. Walters, R. Kamalapurkar, F. Voight, E. Schwartz, and W. E. Dixon, "Online Approximate Optimal Station Keeping of a Marine Craft in the Presence of an Irrotational Current," IEEE Transactions on Robotics, Vol. 34, No. 2, pp. 486-496 (2018) . E. J. Gonzalez, R. J. Downey, C. A. Rouse, and W. E. Dixon, "Influence of Elbow Flexion and Stimulation Site on Neuromuscular Electrical Stimulation of the Biceps Brachii," IEEE Transactions on Neural Systems and Rehabilitation Engineering, Vol. 26, No. 4, pp. 904-910 (2018). J. R. Klotz, A. Parikh, T.-H. Cheng, and W. E. Dixon, "Decentralized Synchronization of Uncertain Nonlinear Systems with a Reputation Algorithm," IEEE Transactions on Control of Network Systems, Vol. 5, No. 1, pp. 434-445 (2018). R. Kamalapurkar, J. R. Klotz, P. Walters, and W. E. Dixon, "Model-based Reinforcement Learning for Differential Graphical Games," IEEE Transactions on Control of Network Systems, Vol. 5, No. 1, pp. 423-433 (2018). Z. Feng, G. Hu, W. Ren, W. E. Dixon, J. Mei, "Distributed Coordination of Multiple Unknown Euler-Lagrange Systems," IEEE Transactions on Control of Network Systems, Vol. 5, No. 1, pp. 55-66 (2018). J. R. Klotz, S. Obuz, Z. Kan, and W. E. Dixon, "Synchronization of Uncertain Euler-Lagrange Systems with Uncertain Time-Varying Communication Delays," IEEE Transactions on Cybernetics, Vol. 48, No. 2, pp. 807-817 (2018). R. Licitra, Z. I. Bell, E. Doucette, and W. E. Dixon, "Single Agent Indirect Herding of Multiple Targets: A Switched Adaptive Control Approach," IEEE Control Systems Letters, Vol. 2, No. 1, pp. 127-132 (2018). C. Rouse, V. H Duenas, C.Cousin, A. Parikh, and W. E. Dixon "A Switched Systems Approach Based on Changing Muscle Geometry of the Biceps Brachii During Functional Electrical Stimulation," IEEE Control Systems Letters, Vol. 2, No. 1, pp. 73-78 (2018). N. Sharma, N. A. Kirsch, N. A. Alibeji, and W. E. Dixon, "A Nonlinear Control Method to Compensate for Muscle Fatigue During Neuromuscular Electrical Stimulation," Frontiers Robotics and AI , Vol 4, Article 68 (2017). T.-H. Cheng, Z. Kan, J. R. Klotz, J. M. Shea, and W. E. Dixon, "Event-Triggered Control of Multi-Agent Systems for Fixed and Time-Varying Network Topologies," IEEE Transactions on Automatic Control, Vol. 62, No. 10, pp. 5365-5371 (2017). R. Downey, M. Merad, E. Gonzalez, and W. E. Dixon, "The Time-Varying Nature of Electromechanical Delay and Muscle Control Effectiveness in Response to Stimulation-Induced Fatigue," IEEE Transactions on Neural Systems and Rehabilitation Engineering, Vol. 25, No. 9, pp. 1397-1408 (2017). H. Dinh, S. Bhasin, R. Kamalapurkar, and W. E. Dixon, "Dynamic Neural Network-Based Output Feedback Tracking Control for Uncertain Nonlinear Systems," ASME Journal of Dynamic Systems, Measurement and Control, Vol. 139, No. 7, pp. 074502-1-074502-7 (2017). R. Kamalapurkar, B. Reish, G. Chowdhary, and W. E. Dixon, "Concurrent learning for parameter estimation using dynamic state-derivative estimators," IEEE Transactions on Automatic Control, Vol. 62, No. 7, pp. 3594-3601 (2017). J. Rosenfeld and W. E. Dixon, "Approximating the Caputo Fractional Derivative through the Mittag-Leffler Reproducing Kernel Hilbert Space and the Kernelized Adams-Bashforth-Moulton Method," SIAM Journal on Numerical Analysis, Vol. 53, No. 3, pp. 1201-1217 (2017). R. J. Downey, T.-H. Cheng, M. J. Bellman, and W. E. Dixon, "Switched Tracking Control of the Lower Limb during Asynchronous Neuromuscular Electrical Stimulation: Theory and Experiments," IEEE Transactions On Cybernetics, Vol. 47, No. 5, pp. 1251-1262 (2017). M. J. Bellman, R. J. Downey, A. Parikh and W. E. Dixon, "Automatic Control of Cycling Induced by Functional Electrical Stimulation with Electric Motor Assistance," IEEE Transactions on Automation Science and Engineering, Vol. 14, No. 2, pp. 1225-1234 (2017). A. Parikh, T.-H. Cheng, H.-Y. Chen, and W. E. Dixon, "A Switched Systems Framework for Guaranteed Convergence of Image-Based Observers with Intermittent Measurements," IEEE Transactions on Robotics, Vol. 33, No. 2, pp. 266-280 (2017). R. Kamalapurkar, L. Andrews, P. Walters, and W. E. Dixon, "Model-Based Reinforcement Learning for Infinite-Horizon Approximate Optimal Tracking," IEEE Transactions on Neural Networks and Learning Systems, Vol. 28, No. 3, pp. 753-758 (2017). Z. Kan, J. R. Klotz, E. Doucette, J. Shea, and W. E. Dixon, "Decentralized Rendezvous of Nonholonomic Robots with Sensing and Connectivity Constraints," ASME Journal of Dynamic Systems, Measurement, and Control, Vol. 139, No. 2, pp. 024501-1-024501-7 (2017). S. Obuz, J. R. Klotz, R. Kamalapurkar, and W. E. Dixon, "Unknown Time-Varying Input Delay Compensation for Uncertain Nonlinear Systems," Automatica, Vol. 76, pp. 222-229 (2017). M. J. Bellman, T. -H. Cheng, R. J. Downey, C. J. Hass, and W. E. Dixon, "Switched Control of Cadence During Stationary Cycling Induced by Functional Electrical Stimulation," IEEE Transactions on Neural Systems and Rehabilitation Engineering, Vol. 24, No. 12, pp. 1373-1383 (2016). J. Klotz, T.-H. Cheng, and W. E. Dixon, "Robust Containment Control in a Leader-Follower Network of Uncertain Euler-Lagrange Systems," International Journal of Robust and Nonlinear Control, Vol. 26, pp. 3791-3805 (2016). R. Kamalapurkar, J. Rosenfeld, and W. E. Dixon, "Efficient model-based reinforcement learning for approximate online optimal control," Automatica, Vol. 74, pp. 247-258 (2016). W. E. Dixon and M. J. Bellman, "Cycling Induced by Functional Electrical Stimulation: A Control Systems Perspective," ASME Dynamic Systems & Control Magazine, Vol. 4, No. 3, pp. 3-7 (2016). D. Chwa, A. Dani, and W. E. Dixon, "Range and Motion Estimation of a Monocular Camera using Static and Moving Objects," IEEE Transactions on Control Systems Technology, Vol. 24, No. 4, pp. 1174-1183 (2016). T. H. Cheng, Q. Wang, R. Kamalapurkar, H. T. Dinh, M. J. Bellman, and W. E. Dixon, "Identification-based Closed-loop NMES Limb Tracking with Amplitude-Modulated Control Input," IEEE Transactions on Cybernetics, Vol. 46, No. 7, pp. 1679-1690 (2016). W. Mackunis, F. Leve, P. Patre, N. Fitz-Coy, and W. E. Dixon, "Adaptive Neural Network-based Satellite Attitude Control in the Presence of CMG Uncertainty," Aerospace Science and Technology, Vol. 54, pp. 218-228 (2016). B. Bialy, I. Chakraborty, S. Cekic, W. E. Dixon, "Adaptive Boundary Control of Store Induced Oscillations in a Flexible Aircraft Wing," Automatica, Vol. 70, pp. 230-238 (2016). Z. Kan, J. M. Shea, and W. E. Dixon, "Leader-Follower Containment Control Over Directed Random Graphs," Automatica, Vol. 66, pp. 56-62 (2016). R. Kamalapurkar, N. Fischer, S. Obuz, and W. E. Dixon, "Time-Varying Input and State Delay Compensation for Uncertain Nonlinear Systems," IEEE Transactions on Automatic Control, Vol. 61, No. 3, pp. 834-839 (2016). M. Merad, R. J. Downey, S. Obuz, and W. E. Dixon, "Isometric Torque Control for Neuromuscular Electrical Stimulation with Time-Varying Input Delay," IEEE Transactions on Control Systems Technology, Vol. 24, No. 3, pp. 971-978 (2016). R. Kamalapurkar, P. Walters, and W. E. Dixon, "Model-Based Reinforcement Learning for Approximate Optimal Regulation," Automatica, Vol. 64, pp. 94-104 (2016). R. J. Downey, T. H. Cheng, M. J. Bellman, and W. E. Dixon, "Closed-loop Asynchronous Electrical Stimulation Prolongs Functional Movements in the Lower Body," IEEE Transactions on Neural Systems and Rehabilitation Engineering, Vol. 23, No. 6, pp. 1117-1127 (2015). R. J. Downey, M. J. Bellman, H. Kawai, C. M. Gregory, and W. E. Dixon, "Comparing the Induced Muscle Fatigue Between Asynchronous and Synchronous Electrical Stimulation in Able-Bodied and Spinal Cord Injured Populations," IEEE Transactions on Neural Systems and Rehabilitation Engineering, Vol. 23, No. 6, pp. 964-972 (2015). M. Johnson, R. Kamalapurkar, S. Bhasin, W. E. Dixon, "Approximate N-Player Nonzero-Sum Game Solution for an Uncertain Continuous Nonlinear System," IEEE Transactions on Neural Networks and Learning Systems, Vol. 26, No. 8, pp. 1645-1658 (2015). J. Klotz, Z. Kan, J. M. Shea, E. L. Pasiliao, and W. E. Dixon, "Asymptotic Synchronization of a Leader-Follower Network of Uncertain Euler-Lagrange Systems," IEEE Transactions on Control of Network Systems, Vol. 2, No. 2, pp. 174-182 (2015). Z. Kan, J. Klotz, E. Pasiliao, and W. E. Dixon, "Containment Control for a Social Network with State-Dependent Connectivity," Automatica, Vol 56, pp. 86-92 (2015). Z. Kan, L. Navaravong, J. Shea, E. Pasiliao, and W. E. Dixon, "Graph Matching Based Formation Reconfiguration of Networked Agents with Connectivity Maintenance," IEEE Transactions on Control of Network Systems, Vol. 2, No 1. pp. 24-35. R. Kamalapurkar, H. Dinh, S. Bhasin, W. E. Dixon, "Approximate Optimal Trajectory Tracking for Continuous-Time Nonlinear Systems," Automatica, Vol. 51, pp. 40-48 (2015). R. Kamalapurkar, J. Klotz, and W. E. Dixon, "Concurrent learning-based online approximate feedback Nash equilibrium solution of N -player nonzero-sum differential games," Acta Automatica Sinica (Special Issue on Reinforcement Learning), Vol. 1, No. 3, pp. 239-247 (2014) . B. J. Bialy, L. Andrews, J. W. Curtis, and W. E. Dixon, "Saturated RISE Tracking Control of Store-Induced Limit Cycle Oscillations," AIAA Journal of Guidance, Control, and Dynamics, Vol. 37, pp. 1316-1322 (2014). R. J. Downey, M. Tate, H. Kawai, and W. E. Dixon "Comparison of force ripple during asynchronous and conventional stimulation," Muscle and Nerve, Vol. 50, No. 4, pp. 549-555 (2014). H. T. Dinh, R. Kamalapurkar, S. Bhasin and W. E. Dixon, "Dynamic Neural Network-based Robust Observers for Uncertain Nonlinear Systems," Neural Networks, Vol. 60, pp. 44-52 (2014). B. J. Bialy, C. L. Pasiliao, H. T. Dinh, W. E. Dixon, "Lyapunov-Based Tracking Control of Store-Induced Limit Cycle Oscillations in an Airfoil Section," ASME Journal of Dynamic Systems, Measurement, and Control, Vol. 136, No. 6 (2014). S. Subramanian, J. M. Shea, and W. E. Dixon, "Power Control for Cellular Communications with Time-Varying Channel Uncertainties," Asian Journal of Control, Vol. 16, No. 5, pp. 1459-1469 (2014). N. Fischer, D. Hughes, P. Walters, E. Schwartz, and W. E. Dixon, "Nonlinear RISE-based Control of an Autonomous Underwater Vehicle," IEEE Transactions on Robotics, Vol. 30, No. 4, pp. 845-852 (2014). W. Mackunis, N. Gans, A. Parikh, and W. E. Dixon, "Unified Tracking and Regulation Visual Servo Control for Wheeled Mobile Robot," Asian Journal of Control, Vol. 16, No. 3, pp. 669-678, (2014). N. Fischer, Z. Kan, R. Kamalapurkar, and W. E. Dixon, "Saturated RISE Feedback Control for a Class of Second-Order Nonlinear Systems," IEEE Transactions on Automatic Control, Vol. 59, No. 4., pp. 1094-1099 (2014). Q. Wang, N. Sharma, M. Johnson, C. M. Gregory, and W. E. Dixon, "Adaptive Inverse Optimal Neuromuscular Electrical Stimulation," IEEE Transactions on Cybernetics, Vol. 43, No. 6, pp. 1710-1718 (2013). N. Fischer, R. Kamalapurkar, and W. E. Dixon, "LaSalle-Yoshizawa Corollaries for Nonsmooth Systems," IEEE Transactions on Automatic Control, Vol. 58, No. 9, pp. 2333-2338 (2013). N. Fischer, A. Dani, N. Sharma, and W. E. Dixon, "Saturated Control of an Uncertain Nonlinear System with Input Delay," Automatica, Vol. 49, No. 6, pp. 1741-1747 (2013). S. Bhasin, R. Kamalapurkar, M. Johnson, K. Vamvoudakis, F. L. Lewis, and W. E. Dixon, "A novel actor-critic-identifier architecture for approximate optimal control of uncertain nonlinear systems," Automatica, Vol. 49, No. 1, pp. 89-92 (2013). S. Bhasin, R. Kamalapurkar, H. T. Dinh, and W. E. Dixon, "Robust Identification-based State Derivative Estimation for Nonlinear Systems," IEEE Transactions on Automatic Control, Vol. 58, No. 1, pp. 187-192 (2013). D. Kim, F. Leve, N. Fitz-Coy, and W. E. Dixon "A New Initial Start-up Method Using Internal Momentum Management of VSCMGs," AIAA Journal of Guidance, Control, and Dynamics, Vol. 35, No. 5, pp. 1472-1482 (2012). L. Navaravong, Z. Kan, J. M. Shea, and W. E. Dixon, "Formation Reconfiguration for Mobile Robots with Network Connectivity Constraints," IEEE Network, Vol 26, No 4., pp. 18-24 (2012). J. Shin, H.J. Kim, Y. Kim, and W. E. Dixon, "Autonomous Flight of the Rotorcraft-based UAV Using RISE Feedback and NN Feedforward Terms," IEEE Transactions on Control Systems Technology, Vol. 20, No. 5, pp. 1392-1399 (2012). Z. Kan, A. Dani, J. Shea, and W. E. Dixon, "Network Connectivity Preserving Formation Stabilization and Obstacle Avoidance via a Decentralized Controllerr," IEEE Transactions on Automatic Control, Vol. 57, No. 7, pp. 1827- 1832 (2012). G. Hu, W. E. Dixon, H. Ding, "Robust Tracking Control of an Array of Nanoparticles Moving on a Substrate," Automatica , Vol. 48, No. 2, pp. 442-448 (2012). A. Dani, N. Fisher, Z. Kan, and W. E. Dixon, "Globally Exponentially Stable Observer for Vision-based Range Estimation," Mechatronics , Special Issue on Visual Servoing, Vol. 22, No. 4, pp. 381-389 (2012). N.R. Gans, G. Hu, J. Shen, Y. Zhang, and W. E. Dixon, "Adaptive Visual Servo Control to Simultaneously Stabilize Image and Pose Error," Mechatronics , Special Issue on Visual Servoing, Vol. 22, No. 4, pp. 410-422 (2012). S. S. Mehta, V. Jayaraman, T. F. Burks, W. E. Dixon, "Teach by Zooming: A unified Approach to Visual Servo Control," Mechatronics , Special Issue on Visual Servoing, Vol. 22, No. 4, pp. 436-443 (2012). N. Sharma, C. Gregory, M. Johnson, and W. E. Dixon, "Closed-Loop Neural Network-based NMES Control for Human Limb Tracking," IEEE Transactions on Control Systems Technology, Vol. 20, No. 3, pp. 712-725 (2012). A. Dani, N. Fisher, and W. E. Dixon, "Single Camera Structure and Motion," IEEE Transactions on Automatic Control , Vol. 57, No. 1, pp. 241-246 (2012). N. Sharma, S. Bhasin, Q. Wang, and W. E. Dixon, "RISE-Based Adaptive Control of a Control Affine Uncertain Nonlinear System with Unknown State Delays," IEEE Transactions on Automatic Control, Vol. 57, No. 1, pp. 255-259 (2012). N. Sharma, C. Gregory, and W. E. Dixon, "Predictor-based Compensation for Electromechanical Delay During Neuromuscular Electrical Stimulation," IEEE Transactions on Neural Systems and Rehabilitation Engineering , Vol. 19, No. 6, pp. 601-611 (2011). N. Sharma, S. Bhasin, Q. Wang, and W. E. Dixon, "Predictor-Based Control for an Uncertain Euler-Lagrange System with Input Delay," Automatica, Vol. 47, No. 11, pp. 2332-2342 (2011). D. Kim, W. Mackunis, N. Fitz-Coy, W. E. Dixon, "Precision IPACS in the Presence of Dynamic Uncertainty," AAS The Journal of the Astronautical Sciences, Vol. 58, No. 1, (2011). R. J. Downey, M. Bellman, N. Sharma, Q. Wang, C. M. Gregory, and W. E. Dixon, "A Novel Modulation Strategy to Increase Stimulation Duration in Neuromuscular Electrical Stimulation," Muscle and Nerve, Vol 44., No. 3, pp. 382-387 (2011). N.R. Gans, G. Hu, K. Nagarajan, and W. E. Dixon, "Keeping Multiple Moving Targets in the Field of View of a Mobile Camera," IEEE Transactions on Robotics and Automation , Vol. 27, No. 4, pp. 822-828 (2011). S. Bhasin, N. Sharma, P. Patre, and W. E. Dixon, "Asymptotic Tracking by a Reinforcement Learning-Based Adaptive Critic Controller," Journal of Control Theory and Applications , Vol. 9, No. 3, pp. 400-409 (2011). S. Bhasin, K. Dupree, P. M. Patre, and W. E. Dixon, "Neural Network Control of a Robot Interacting with an Uncertain Viscoelastic Environment," IEEE Transactions on Control Systems Technology, Vol. 19, No. 4, pp. 947-955 (2011). P. Patre, W. Mackunis, K. Dupree, and W. E. Dixon, "Modular Adaptive Control of Uncertain Euler-Lagrange Systems with Additive Disturbances," IEEE Transactions on Automatic Control, Vol. 56, No. 1, pp. 155-160 (2011). K. Dupree, P. Patre, Z. Wilcox, and W. E. Dixon, "Asymptotic Optimal Control of Uncertain Nonlinear Euler-Lagrange Systems," Automatica, Vol 47, No. 1, pp. 99-107 (2011). W. MacKunis, P. M. Patre, K. Kaiser, and W. E. Dixon, "Asymptotic Tracking for Aircraft via Robust and Adaptive Dynamic Inversion Methods," IEEE Transactions on Control Systems Technology, vol.18, no.6, pp. 1448 - 1456 (2010). W. MacKunis, Z. D. Wilcox, M. K. Kaiser, and W. E. Dixon, "Global Adaptive Output Feedback Tracking Control of an Unmanned Aerial Vehicle," IEEE Transactions on Control Systems Technology, vol.18, no.6, pp. 1390-1397 (2010). Z. Wilcox, W. MacKunis, S. Bhat, R. Lind, and W. E. Dixon, "Lyapunov-Based Exponential Tracking Control of a Hypersonic Aircraft with Aerothermoelastic Effects," AIAA Journal of Guidance, Control, and Dynamics, vol.33, no.4, pp. 1213-1224 (2010). K. Kaiser, N. Gans, and W. E. Dixon, "Vision-Based Estimation for Guidance, Navigation, and Control of an Aerial Vehicle," IEEE Transactions on Aerospace and Electronic Systems, Vol. 46, No. 3, pp. 1064-1077 (2010). P. Patre, S. Bhasin, Z. D. Wilcox, and W. E. Dixon, "Composite Adaptation for Neural Network-Based Controllers," IEEE Transactions on Automatic Control, Vol. 55, No. 4, pp. 944-950 (2010). L. Ma, C. Cao, N. Hovakimyan, C. Woolsey, and W. E. Dixon, "Fast Estimation for Range Identification in the Presence of Unknown Motion Parameters," IMA Journal of Applied Mathematics,Vol. 75, No. 2, pp. 165-189, 2010. G. Hu, N. Gans, and W. E. Dixon, "Quaternion-Based Visual Servo Control in the Presence of Camera Calibration Error," International Journal of Robust and Nonlinear Control, Vol. 20, No. 5, pp. 489-503 (2010). P. Patre, W. Mackunis, M. Johnson, and W. E. Dixon, "Composite Adaptive Control for Euler-Lagrange Systems with Additive Disturbances," Automatica, Vol. 46, No. 1, pp. 140-147 (2010). G. Hu, N. Gans, N. Fitz-Coy, and W. E. Dixon, "Adaptive Homography-Based Visual Servo Tracking Control Via A Quaternion Formulation," IEEE Transactions on Control Systems Technology, Vol. 18, No. 1, pp. 128-135 (2010). K. Dupree, C. -H. Liang, G. Hu, and W. E. Dixon, "Lyapunov-Based Control of a Robot and Mass-Spring System Undergoing An Impact Collision," International Journal of Robotics and Automation, Vol. 206, No. 4, pp. 3166-3174 (2009). N. Sharma, K. Stegath, C. M. Gregory, and W. E. Dixon, "Nonlinear Neuromuscular Electrical Stimulation Tracking Control of a Human Limb," IEEE Transactions on Neural Systems and Rehabilitation Engineering, Vol. 17, No. 6, pp. 576 - 584 (2009). N. R. Gans, W. E. Dixon, R. Lind, A. Kurdilla, "A Hardware in the Loop Simulation Platform for Vision-Based Control of Unmanned Air Vehicles," Mechatronics, Vol. 19, No. 7, pp. 1043-1056. V. Subramanian, T. F. Burks, and W. E. Dixon, "Sensor Fusion Using Fuzzy Logic Enhanced Kalman Filter for Autonomous Vehicle Guidance in Citrus Groves," Transactions of the American Society of Agricultural and Biological Engineers (ASABE), Vol. 52, No. 5, pp. 1411-1422 (2009). C. -H. Liang, S. Bhasin, K. Dupree, and W. E. Dixon, "A Force Limiting Adaptive Controller for a Robotic System Undergoing a Non-Contact to Contact Transition," IEEE Transactions on Control Systems Technology, Vol. 17, No. 6, pp. 1330-1341 (2009). G. Hu, W. Mackunis, N. Gans, W. E. Dixon, J. Chen, A. Behal, D.M. Dawson, "Homography-Based Visual Servo Control with Imperfect Camera Calibration," IEEE Transactions on Automatic Control, Vol. 54, No. 6, pp. 1318-1324 (2009). R. Thompson, M. F. Wheling, J. Evers, and W. E. Dixon, "Body Rate Decoupling Using Haltere Mid-stroke Measurements for Inertial Flight Stabilization in Diptera," Journal of Comparative Physiology A: Neuroethology, Sensory, Neural, and Behavioral Physiology, VOl. 195, pp. 99-112 (2009). C. M. Gregory, C. S. Bickel, N. Sharma, and W. E. Dixon, "Comparing the Force- and Excursion-Frequency Relationships in Human Skeletal Muscle," Muscle and Nerve, Vol. 38, No. 6, pp. 1627-1629 (2008). P. M. Patre, W. MacKunis, K. Kaiser, and W. E. Dixon, "Asymptotic Tracking for Uncertain Dynamic Systems via a Multilayer Neural Network Feedforward and RISE Feedback Control Structure," IEEE Transactions on Automatic Control, Vol. 53, No. 9, pp. 2180-2185 (2008). G. Hu, D. Aiken, S. Gupta, W.E. Dixon, "Lyapunov-Based Range Identification For A Paracatadioptric System," IEEE Transactions on Automatic Control, Vol. 53, No. 7, pp. 1775-1781 (2008). W. MacKunis, K. Dupree, N. Fitz-Coy, and W. E. Dixon, "Adaptive Satellite Attitude Control in the Presence of Inertia and CMG Gimbal Friction Uncertainties," AAS The Journal of the Astronautical Sciences, Vol. 56, No. 1, pp. 121-134 (2008). K. Dupree, C. Liang, G. Hu, and W. E. Dixon, "Global Adaptive Lyapunov-Based Control of a Robot and Mass-Spring System Undergoing An Impact Collision," IEEE Transactions on Systems, Man, and Cybernetics -Part B: Cybernetics, Vol. 38, No. 4, pp. 1050-1061 (2008). K. Dupree, N. R. Gans, W. MacKunis, and W. E. Dixon, "Euclidean Calculation of Feature Points of a Rotating Satellite: A Daisy Chaining Approach," AIAA Journal of Guidance, Control, and Dynamics, Vol. 31, No. 4, pp. 954-961 (2008) . D. Braganza, W. E. Dixon, D. M. Dawson, B. Xian, "Tracking Control for Robot Manipulators with Kinematic and Dynamic Uncertainty," International Journal of Robotics and Automation, Vol. 23, No. 2 (2008). S. S. Mehta, T. Burks, W. E. Dixon, "Vision-Based Localization of a Wheeled Mobile Robot in Greenhouse Applications: A Daisy Chaining Approach," Computers and Electronics in Agriculture, Vol. 63, pp. 28-37 (2008). P. M. Patre, W. Mackunis, C. Makkar, and W. E. Dixon, "Asymptotic Tracking for Systems with Structured and Unstructured Uncertainties," IEEE Transactions on Control Systems Technology, Vol. 16, No. 2, pp. 373-379 (2008). C. Makkar, G. Hu, W. G. Sawyer, W. E. Dixon, "Lyapunov-Based Tracking Control in the Presence of Uncertain Nonlinear Parameterizable Friction," IEEE Transactions on Automatic Control, Vol. 52, No. 10, pp. 1988-1994 (2007). G. Hu, C. Makkar, and W. E. Dixon, "Energy-Based Nonlinear Control of Underactuated Euler-Lagrange Systems Subject to Impacts," IEEE Transactions on Automatic Control, Vol. 52, No.9, pp. 1742-1748 (2007). J. Chen, D. M. Dawson, W. E. Dixon, and V. Chitrakaran, "Navigation Function Based Visual Servo Control," Automatica, Vol. 43, pp. 1165-1177 (2007). C. M. Gregory, W. E. Dixon, C. S. Bickel, "Impact of Varying Pulse Frequency and Duration on Muscle Function during NMES," Muscle and Nerve, Vol. 35, No. 4, pp. 504-509 (2007). W. E. Dixon, "Adaptive Regulation of Amplitude Limited Robot Manipulators with Uncertain Kinematics and Dynamics," IEEE Transactions on Automatic Control, Vol. 52, No. 3, pp. 488 - 493 (2007). M. McIntyre, W. E. Dixon, D. M. Dawson, and E. Tatlicioglu, "Passive Coordination of Bilateral Teleoperated Manipulators," Robotica, Vol. 24, No. 4, pp 463-476, (2006). Y. Fang, W. E. Dixon, D. M. Dawson, and J. Chen, "An Exponential Class of Model-Free Visual Servoing Controllers in the Presence of Uncertain Camera Calibration," International Journal of Robotics and Automation, Vol 21, (2006). X. T. Zhang, D. M. Dawson, W. E. Dixon, and B. Xian, "Extremum Seeking Nonlinear Controllers for a Human Exercise Machine," IEEE Transactions on Mechatronics, Vol. 11, No. 2, pp. 233-240, (2006). J. Chen, W. E. Dixon, D. M. Dawson, and M. McIntyre, "Homography-Based Visual Servo Tracking Control of a Wheeled Mobile Robot," IEEE Transactions on Robotics, Vol. 22, No. 2, pp. 406 - 415, (2006). M. McIntyre, W. E. Dixon, D. M. Dawson, and I. D. Walker, "Fault Detection and Identification for Robot Manipulators," IEEE Transactions on Robotics, Vol. 21, No. 5, pp. 1028-1034, (2005). Y. Fang, W. E. Dixon, D. M. Dawson, and P. Chawda, "Homography-Based Visual Servoing of Wheeled Mobile Robots," IEEE Transactions on Systems, Man, and Cybernetics -Part B: Cybernetics, Vol. 35, No. 5, pp. 1041-1050, (2005). J. Chen, D. M. Dawson, W. E. Dixon, and A. Behal, "Adaptive Homography-Based Visual Servo Tracking for Fixed and Camera-in-Hand Configurations," IEEE Transactions on Control Systems Technology, Vol. 13, No. 5, pp. 814-825, (2005). A. Behal, P. Setlur, W. E. Dixon, and D. M. Dawson, "Adaptive Position and Orientation Regulation for the Camera-in-Hand Problem," Journal of Robotic Systems, Vol. 22, No. 9, pp. 457-473, (2005). V. Chitrakaran, D. M. Dawson, W. E. Dixon, and J. Chen, "Identification of a Moving Object's Velocity with a Fixed Camera," Automatica, Vol. 41, No.3, pp. 553-562, (2005). M. W. Noakes and W. E. Dixon, "Ergonomic interface concepts for minimally invasive, remote, and virtual surgical systems," Studies in health technology and informatics, Vol. 98, pp. 275-277, (2004). D. L. Jung, W. E. Dixon, and F. G. Pin, "Ergonomic interface concepts for minimally invasive, remote, and virtual surgical systems," Studies in health technology and informatics, Vol. 98, pp. 144-146, (2004). W. E. Dixon, E. Zergeroglu, and D. M. Dawson, "Global Robust Output Feedback Tracking Control of Robot Manipulators," Robotica, Vol. 22, No. 4, pp. 351-357, (2004). W. E. Dixon, M. S. de Queiroz, D. M. Dawson, and T. J. Flynn, "Adaptive Tracking and Regulation Control of a Wheeled Mobile Robot with Controller/Update Law Modularity," IEEE Transactions on Control Systems Technology, Vol. 12, No. 1, pp. 138-147, (2004). W. E. Dixon, Y. Fang, D. M. Dawson, and T. J. Flynn, "Range Identification for Perspective Vision Systems," IEEE Transactions on Automatic Control, Vol. 48, No. 12, pp. 2232-2238, (2003). Y. Fang, W. E. Dixon, D. M. Dawson, and E. Zergeroglu, "Nonlinear Coupling Control Laws for a 3-DOF Overhead Crane System," IEEE Transactions on Mechatronics, Vol. 8, No. 3, pp. 418-423, (2003). W. E. Dixon and J. Chen, "Comments on A Composite Energy Function-Based Learning Control Approach for Nonlinear Systems with Time-Varying Parametric Uncertainties," IEEE Transactions on Automatic Control, Vol. 48, No. 9, pp. 1671-1672, (2003). W. E. Dixon, E. Zergeroglu, D. M. Dawson, and B. T. Costic, "Repetitive Learning Control: A Lyapunov-Based Approach," IEEE Transactions on Systems, Man, and Cybernetics -Part B: Cybernetics, Vol. 32, No. 4, pp. 538-545, (2002). W. E. Dixon, D. M. Dawson, B. T. Costic, and M. S. de Queiroz, "A MATLAB-Based Control Systems Laboratory Experience for Undergraduate Students: Towards Standardization and Shared Resources," IEEE Transactions on Education, Vol. 45, No. 3, pp. 218-226, (2002). A. Behal, D. M. Dawson, W. E. Dixon, and Y. Fang, "Tracking and Regulation Control of an Underactuated Surface Vessel with Nonintegrable Dynamics," IEEE Transactions on Automatic Control, Vol. 47, No. 3, pp. 495-500, (2002). W. E. Dixon and E. Zergeroglu, "Comments on Adaptive Variable Structure Setpoint Control of Underactuated Robots," IEEE Transactions on Automatic Control, Vol. 46, No. 5, pp. 812, (2001). W. E. Dixon, D. M. Dawson, E. Zergeroglu, and A. Behal, "Adaptive Tracking Control of a Wheeled Mobile Robot via an Uncalibrated Camera System," IEEE Transactions on Systems, Man, and Cybernetics -Part B: Cybernetics, Vol. 31, No. 3, pp. 341-352, (2001). W. E. Dixon, I. D. Walker, D. M. Dawson, and J. P. Hartranft, "Fault Detection for Robot Manipulators with Parametric Uncertainty: A Prediction Error Based Approach," IEEE Transactions on Robotics and Automation, Vol. 16, No. 6, pp. 689-699, (2000). W. E. Dixon, D. M. Dawson, and E. Zergeroglu, "Tracking and Regulation Control of a Mobile Robot System with Kinematic Disturbances: A Variable Structure-Like Approach," Transactions of the ASME: Journal of Dynamic Systems, Measurement and Control, Vol. 122, pp. 616-623, (2000). W. E. Dixon, Z. P. Jiang, and D. M. Dawson, "Global Exponential Setpoint Control of Wheeled Mobile Robots: A Lyapunov Approach," Automatica, Vol. 36, No. 11, pp. 1741-1746, (2000). M. S. de Queiroz, F. Zhang, and W. E. Dixon, "Comments on Redesign of Hybrid Adaptive/Robust Motion Control of Rigid-Link Electrically-Driven Robot Manipulators," IEEE Transactions on Robotics and Automation, Vol. 16, No. 4, pp. 448-449, (2000). W. E. Dixon and E. Zergeroglu, "Comments on Sliding-Mode Motion/Force Control of Constrained Robots," IEEE Transactions on Automatic Control, Vol. 45, No. 8, pp. 1576-1577, (2000). F. Zhang, D. M. Dawson, M. S. de Queiroz, and W. E. Dixon, "Global Adaptive Output Feedback Tracking Control of Robot Manipulators," IEEE Transactions on Automatic Control, Vol. 45, No. 6, pp. 1203-1208, (2000). E. Zergeroglu, W. E. Dixon, A. Behal, and D. M. Dawson, "Adaptive Set-Point Control of Robotic Manipulators with Amplitude-Limited Control Inputs," Robotica, Vol. 18, No. 2, pp. 171-181, (2000). W. E. Dixon, E. Zergeroglu, D. M. Dawson, and M. W. Hannan, "Global Adaptive Partial State Feedback Tracking Control of Rigid-Link Flexible-Joint Robots," Robotica, Vol. 18. No 3. pp. 325-336, (2000). W. E. Dixon, D. M. Dawson, E. Zergeroglu, and F. Zhang, "Robust Tracking and Regulation Control for Mobile Robots," International Journal of Robust and Nonlinear Control, Vol. 10, pp. 199-216, (2000). W. E. Dixon, D. M. Dawson, F. Zhang, and E. Zergeroglu, "Global Exponential Tracking Control of A Mobile Robot System via a PE Condition," IEEE Transactions on Systems, Man, and Cybernetics -Part B: Cybernetics, Vol. 30, No. 1, pp. 129-142, (2000). 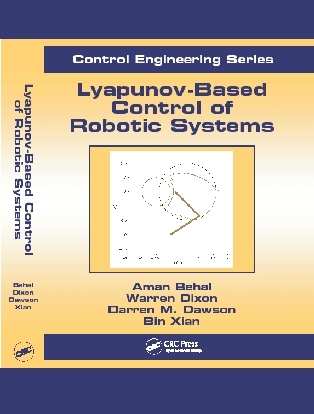 E. Zergeroglu, W. E. Dixon, D. M. Dawson, and A. Behal, "Lyapunov-Based Set-Point Control of the Acrobot," International Journal of Robotics and Automation, Vol. 14, No. 4, pp. 161-170, (1999). M. Feemster, D. M. Dawson, A. Behal, and W. E. Dixon, "Tracking Control in the Presence of Nonlinear Dynamic Frictional Effects: Robot Extension," Asian Journal of Control, Vol. 1, No. 3, pp. 153-168, (1999). E. Zergeroglu, W. E. Dixon, D. Haste, and D. M. Dawson, "Composite Adaptive Output Feedback Tracking Control of Robotic Manipulators," Robotica, Vol. 17, pp. 591-600, (1999). C. Rouse, C. Cousin, B. C. Allen, and W. E. Dixon, "Split-Crank Cadence Tracking for Switched Motorized FES-Cycling with Volitional Pedaling," American Control Conference, Philadelphia, PA, July 2019. F. Zegers, H.-Y. Chen, P. Deptula, and W. E. Dixon, "A Switched Systems Approach to Consensus of a Distributed Multi-agent System with Intermittent Communication," American Control Conference, Philadelphia, PA, July 2019. C. Cousin, P. Deptula, C. Rouse, and W. E. Dixon, "Cycling With Functional Electrical Stimulation and Adaptive Neural Network Admittance Control," American Control Conference, Philadelphia, PA, July 2019. F. I. Esquivel Estay, C. Rouse, M. Cohen, C. Cousin, and W. E. Dixon, "Cadence and Position Tracking for Decoupled Legs during Switched Split-Crank Motorized FES-Cycling," American Control Conference, Philadelphia, PA, July 2019. J. Feng, W. E. Dixon, T. Wong, and J. Shea, "Optimal Jammer Placement in the Real Plane to Partition a Wireless Network," IEEE Wireless Communications and Networking Conference, Marrakech, Morocco, April 2019. C. Riano-Rios, R. Bevilacqua, and W. E. Dixon, "Relative Maneuvering for Multiple Spacecraft via Differential Drag using LQR and Constrained Least Squares," AAS/AIAA Space Flight Mechanics Meeting, Ka'anapali, HI, January 2019. V. Duenas, C. A. Cousin, C. Rouse, and W. E. Dixon, "Extremum Seeking Control for Power Tracking via Functional Electrical Stimulation," IFAC Conference on Cyber-Physical & Human-Systems, Miami, FL, December 2018, pp. 164-169. C. Rouse, C. A. Cousin, V. Duenas, and W. E. Dixon, "FES and Motor Assisted Cycling to Track Power and Cadence to Desired Voluntary Bounds," IFAC Conference on Cyber-Physical & Human-Systems, Miami, FL, December 2018, pp. 34-39. C. A. Cousin, V. Duenas, C. Rouse, and W. E. Dixon, "Admittance Control of Motorized Functional Electrical Stimulation Cycle," IFAC Conference on Cyber-Physical & Human-Systems, Miami, FL, December 2018, pp. 328-333. C. Cousin, V. H Duenas, C. Rouse, and W. E. Dixon, "Cadence and Admittance Control of a Motorized Functional Electrical Stimulation Cycle," IEEE Conference on Decision and Control , Miami, FL, December 2018, pp. 6470-6475. P. Deptula, Z. I. Bell, F. Zegers, R. Licitra, and W. E. Dixon, "Single Agent Indirect Herding via Approximate Dynamic Programming," IEEE Conference on Decision and Control , Miami, FL, December 2018, pp. 7136-7141. F. Zegers, H.-Y. Chen, P. Deptula, and W. E. Dixon, "Distributed Coordination of a Multi-agent System with Intermittent Communication: A Switched Systems Approach," ASME Dynamic Systems and Controls Conference, Atlanta GA, September 2018. C. Rouse, C. Cousin, V. H. Duenas, and W. E. Dixon, "Varying Motor Assistance During Biceps Curls Induced Via Functional Electrical Stimulation," ASME Dynamic Systems and Controls Conference, Atlanta GA, September 2018. C. Cousin, V. H. Duenas, C. Rouse, and W. E. Dixon, "Stable Cadence Tracking of Admitting Functional Electrical Stimulation Cycle," ASME Dynamic Systems and Controls Conference, Atlanta GA, September 2018. P. Deptula, R. Licitra, J. A. Rosenfeld, and W. E. Dixon, "Online Approximate Optimal Path-Planner in the Presence of Mobile Avoidance Regions," American Control Conference , Milwaukee, WI, June 2018, pp. 2515-2520. P. Deptula, Z. I. Bell, E. Doucette, J. W. Curtis, and W. E. Dixon, "Data-Based Reinforcement Learning Approximate Optimal Control for an Uncertain Nonlinear System with Partial Loss of Control Effectiveness," American Control Conference , Milwaukee, WI, June 2018, pp. 2521-2526. C. Cousin, V. H. Duenas, C. Rouse, and W. E. Dixon, "Admittance Trajectory Tracking using a Challenge-Based Rehabilitation Robot with Functional Electrical Stimulation," American Control Conference , Milwaukee, WI, June 2018, pp. 3732-3737. V. H. Duenas, C. Cousin, V. Ghanbari, and W. E. Dixon, "Passivity-Based Learning Control for Torque and Cadence Tracking in Functional Electrical Stimulation (FES) Induced Cycling," American Control Conference , Milwaukee, WI, June 2018, pp. 3726-3731. C. Rouse, C. Cousin, V. H. Duenas, and W. E. Dixon, "Cadence Tracking for Switched FES Cycling Combined with Voluntary Pedaling and Motor Resistance," American Control Conference , Milwaukee, WI, June 2018, pp. 4558-4563. Z.I. Bell, P. Deptula, H.-Y. Chen, E. Doucette, and W. E. Dixon, "Velocity and Path Reconstruction of a Moving Object Using a Moving Camera," American Control Conference , Milwaukee, WI, June 2018, pp. 5256-5261. C. Rouse, C. Cousin, V. H. Duenas, and W. E. Dixon, "Switched Motorized Assistance during Switched Functional Electrical Stimulation of the Biceps Brachii to Compensate for Fatigue," IEEE Conference on Decision and Control , Melbourne, Australia, December 2017, pp. 5912-5918. H.-Y. Chen, Z. I. Bell, R. Licitra, and W. E. Dixon, " Switched Systems Approach to Vision-Based Tracking Control of Wheeled Mobile Robots," IEEE Conference on Decision and Control , Melbourne, Australia, December 2017, pp. 4902-4907. C. Cousin, V. H. Duenas, C. Rouse, and W. E. Dixon, "Motorized Functional Electrical Stimulation for Torque and Cadence Tracking: A Switched Lyapunov Approach," IEEE Conference on Decision and Control , Melbourne, Australia, December 2017, pp. 5900-5905. R. Kamalapurkar, W. E. Dixon, and A. R. Teel, "On reduction of differential inclusions and Lyapunov stability," IEEE Conference on Decision and Control , Melbourne, Australia, December 2017, pp. 5499-5504. Z. I. Bell, H.-Y. Chen, A. Parikh, and W. E. Dixon, "Single Scene and Path Reconstruction with a Monocular Camera Using Integral Concurrent Learning," IEEE Conference on Decision and Control , Melbourne, Australia, December 2017, pp. 3670-3675. J. Feng, W. E Dixon, and J. M Shea, "Positioning Helper Nodes to Improve Robustness of Wireless Mesh Networks to Jamming Attacks," IEEE Global Communications Conference, Singapore, December 2017. J. Feng, W. E. Dixon, and J. M. Shea, "Fast Algorithms for Jammer Placement to Partition a Wireless Network," IEEE International Conference on Communications, Paris, France, May 2017. R. Licitra, Z. Hutcheson, E. Doucette, and W. E. Dixon, "Single Agent Herding of n-Agents: A Switched Systems Approach," IFAC World Congress, Toulouse, France, July 2017, pp. 14374-14379. I. Chakraborty, S. Mehta, E. Doucette, and W. E. Dixon, "2.5D Visual Servo Control in the Presence of Time-Varying State and Input Delays," American Control Conference, Seattle, WA, 2017, pp. 3741-3746. I. Chakraborty, S. Mehta, E. Doucette, and W. E. Dixon, "Control of an Input Delayed Uncertain Nonlinear System with Adaptive Delay Estimation," American Control Conference, Seattle, WA, 2017, pp. 1779-1784. C. Rouse, A. Parikh, V. Duenas, C. Cousin, and W. E. Dixon, "Compensating for Changing Muscle Geometry of the Biceps Brachii During Neuromuscular Electrical Stimulation: A Switched Systems Approach," IEEE Conference on Decision and Control, Las Vegas, NV, 2016, pp. 1328-1333. V. Duenas, C. Cousin, A. Parikh, and W. E. Dixon, "Functional Electrical Stimulation Induced Cycling using Repetitive Learning Control," IEEE Conference on Decision and Control, Las Vegas, NV, 2016, pp. 2190-2195. Z. Bell, A. Parikh, J. Nezvadovitz, and W. E. Dixon, "Adaptive Control of a Surface Marine Craft with Parameter Identification Using Integral Concurrent Learning," IEEE Conference on Decision and Control, Las Vegas, NV, 2016, pp. 389-394. I. Chakraborty, S. Obuz, and W. E. Dixon, "Image-Based Tracking Control in the Presence of Time-Varying Input and State Delays," IEEE Multi-Conference on Systems and Control, Buenos Aires, Argentina, 2016, pp. 1350-1355. B. Cannataro, Z. Kan, and W. E. Dixon, "Followers Distribution Algorithms for Leader-Follower Networks," IEEE Multi-Conference on Systems and Control, Buenos Aires, Argentina, 2016, pp. 648-653. S. Obuz, A. Parikh, I. Chakraborty, and W. E. Dixon, "Lyapunov-Based Control of an Uncertain Euler-Lagrange System with Uncertain Time-Varying Input Delays without Delay Rate Constraints," IFAC Workshop on Time Delay Systems, Istanbul, Turkey, 2016, pp. 141-146. I. Chakraborty, S. Obuz, and W. E. Dixon, "Control of an Uncertain Nonlinear System with Known Time-Varying Input Delays with Arbitrary Delay Rates," IFAC Symposium on Nonlinear Control Systems , Monterey, California, 2016, pp. 522-527. V. Duenas, C. Cousin, R. Downey, D. Bolser and W. E. Dixon, "Influence of Vibration Stimuli on Neuromuscular Electrical Stimulation of the Quadriceps Femoris Muscle Group," International Functional Electrical Stimulation Society (IFESS), La Grande-Motte, France, 2016. Z. Kan, J. M. Shea, E. Doucette, J. W. Curtis, and W. E. Dixon, "Coverage Control Based Effective Jamming Strategy for Wireless Networks," American Control Conference, Boston, MA 2016, pp. 4655-4660. S. Obuz, R. J. Downey, A. Parikh, and W. E. Dixon, "Compensating for Uncertain Time-varying Delayed Muscle Response in Isometric Neuromuscular Electrical Stimulation Control," American Control Conference, Boston, MA 2016, pp. 4368-4372. I. Chakraborty, S. Obuz, R. Licitra, and W. E. Dixon, "Control of an Uncertain Euler-Lagrange System with Known Time-Varying Input Delay: A PDE-Based Approach," American Control Conference, Boston, MA 2016, pp. 4344-4349. I. Chakraborty, S. Mehta, J. W. Curtis, and W. E. Dixon, "Compensating for Time-Varying Input and State Delays Inherent to Image-Based Control Systems," American Control Conference, Boston, MA 2016, pp. 78-83. A. Parikh, R. Kamalapurkar, H.-Y. Chen, and W. E. Dixon, "Homography Based Visual Servo Control with Scene Reconstruction," IEEE Conference on Decision and Control, Osaka, Japan, 2015, pp. 6972-6977. P. Walters, R. Kamalapurkar, and W. E. Dixon, "Approximate Optimal Online Continuous-Time Path-Planner with Static Obstacle Avoidance," IEEE Conference on Decision and Control, Osaka, Japan, 2015, pp. 650-655. Y. Kushima, K. Kawataka, H. Kawai, Y. Kawai, and W. E. Dixon "FES Knee Bending and Stretching System with RISE-based Tracking Control for Human Limb," IEEE Multi-Conference on Systems and Control, Sydney, Australia, 2015, pp. 870-875. S. Obuz, R. J. Downey, J. R. Klotz, and W. E. Dixon "Unknown Time-Varying Input Delay Compensation for Neuromuscular Electrical Stimulation," IEEE Multi-Conference on Systems and Control, Sydney, Australia, 2015, pp. 365-370. J. Feng, E. L. Pasiliao, W. E. Dixon, and J. M. Shea, "An Optimal Jamming Strategy to Partition a Wireless Network," Military Communications Conference (MILCOM), Tampa, FL 2015, pp. 978-984. K. Vamvoudakis, P. J. Antsaklis, W. E. Dixon, J. P. Hespanha, F. L. Lewis, H. Modares, and B. Kiumarsi, "Autonomy and Machine Intelligence in Complex Systems: A Tutorial," American Control Conference, Chicago, Il 2015, pp. 5062-5079. J. Rosenfeld, R. Kamalapurkar, and W. E. Dixon, "State Following (StaF) Kernel Functions for Function Approximation Part I: Theory and Motivation," American Control Conference, Chicago, Il 2015, pp. 1217-1222. R. Kamalapurkar, J. Rosenfeld, and W. E. Dixon, "State Following (StaF) Kernel Functions for Function Approximation Part II: Adaptive Dynamic Programming," American Control Conference, Chicago, Il 2015, pp. 521-526. A.Parikh, T.-H. Cheng, and W. E. Dixon, "A Switched Systems Approach to Vision-Based Localization of a Target with Intermittent Measurements," American Control Conference, Chicago, Il 2015, pp. 4443-4448. J. R. Klotz, S. Obuz, Z. Kan, and W. E. Dixon, "Synchronization of Uncertain Euler-Lagrange Systems with Unknown Time-Varying Communication Delays," American Control Conference, Chicago, Il 2015, pp. 683-688. J. Klotz, L. Andrews, R. Kamalapurkar, and W. E. Dixon, "Decentralized Monitoring of Leader-Follower Networks of Uncertain Nonlinear Systems," American Control Conference, Chicago, Il 2015, pp. 1393-1398. R. J. Downey, T.-H. Cheng, M. Bellman, and W. E. Dixon, "Switched Tracking Control of a Human Limb during Asynchronous Neuromuscular Electrical Stimulation," American Control Conference, Chicago, Il 2015, pp. 4504-4508. T.-H. Cheng, Z. Kan, J. Klotz, J. Shea, and W. E. Dixon, "Decentralized Event-Triggered Control of Networked Systems-Part 1: Leader-Follower Consensus Under Switching," American Control Conference, Chicago, Il 2015, pp. 5438-5443. T.-H. Cheng, Z. Kan, J. Klotz, J. Shea, and W. E. Dixon, "Decentralized Event-Triggered Control of Networked Systems-Part 2: Containment Control," American Control Conference, Chicago, Il 2015, pp. 5444-5448. A. Parikh, T.-H. Cheng, R. Licitra, and W. E. Dixon, "A Switched Systems Approach to Image-Based Localization of Targets that Temporarily Leave the Field of View," IEEE Conference on Decision and Control, Los Angeles, CA, 2014, pp. 2185-2190. L. Andrews, J. Klotz, R. Kamalapurkar, and W. E. Dixon, "Adaptive dynamic programming for terminally constrained finite-horizon optimal control problems," IEEE Conference on Decision and Control, Los Angeles, CA, 2014, pp. 5095-5100. P. Walters, R. Kamalapurkar, L. Andrews, and W. E. Dixon, "Online Approximate Optimal Path-Following for a Mobile Robot," IEEE Conference on Decision and Control, Los Angeles, CA, 2014, pp. 4536-4541. T.-H. Cheng, Z. Kan, J. Shea, and W. E. Dixon, "Decentralized Event-Triggered Control for Leader-follower Consensus," IEEE Conference on Decision and Control, Los Angeles, CA, 2014, pp. 1244-1249. R. Kamalapurkar, L. Andrews, P. Walters, and W. E. Dixon, "Model-based reinforcement learning for infinite-horizon approximate optimal tracking," IEEE Conference on Decision and Control, Los Angeles, CA, 2014, pp. 5083-5088. M. Bellman, T.-H. Cheng, R. Downey, and W. E. Dixon, "Cadence Control of Stationary Cycling Induced by Switched Functional Electrical Stimulation Control," IEEE Conference on Decision and Control, Los Angeles, CA, 2014, pp. 6260-6265. M. Bellman, T.-H. Cheng, R. Downey, and W. E. Dixon, "Stationary Cycling Induced by Switched Functional Electrical Stimulation Control," American Control Conference, Portland, Oregon, 2014, pp. 4802-4809. H. Kawai, M. Bellman, R. Downey, and W. E. Dixon, "Tracking Control for FES-Cycling based on Force Direction Efficiency with Antagonistic Bi-Articular Muscles," American Control Conference, Portland, Oregon, 2014, pp. 5484-5489. Y. Kawai, R. Downey, H. Kawai, and W. E. Dixon, "Co-Contraction of Antagonist Bi-Articular Muscles for Tracking Control of Human Limb," American Control Conference, Portland, Oregon, 2014, pp. 3316-3321. Z. Kan, S. Mehta, E. Pasiliao, J. W. Curtis, and W. E. Dixon, "Balanced Containment Control and Cooperative Timing of a Multi-Agent System," American Control Conference, Portland, Oregon, 2014, pp. 281-286. T.-H. Cheng, Z. Kan, J. Rosenfeld, and W. E. Dixon, "Decentralized formation control with connectivity maintenance and collision avoidance under limited and intermittent sensing," American Control Conference, Portland, Oregon, 2014, pp. 3201-3206. R. Kamalapurkar, J. Klotz, and W. E. Dixon, "Model-based reinforcement learning for on-line feedback-Nash equilibrium solution of N-player nonzero-sum differential games," American Control Conference, Portland, Oregon, 2014, pp. 3000-3005. J. Klotz, R. Kamalapurkar, and W. E. Dixon, "Concurrent Learning-Based Network Synchronization," American Control Conference, Portland, Oregon, 2014, pp. 796-801. S. Subramanian, J. M. Shea, E. L. Pasiliao, M. M. Carvalho, and W. E. Dixon, "Efficient Spectrum Allocation in Multiband CSMA Networks," IEEE Wireless Communications and Networking Conference, Istanbul, Turkey, 2014, to appear. L. Navaravong, J. M. Shea, E. L. Pasiliao, and W. E. Dixon, "Graph Matching-Based Topology Reconfiguration Algorithm for Systems of Networked Autonomous Vehicles," Military Communications Conference, San Diego, CA, 2013, to appear. R. Downey, T.-H. Cheng, and W. E. Dixon, "Tracking Control of a Human Limb during Asynchronous Neuromuscular Electrical Stimulation," IEEE Conference on Decision and Control, Florence, IT, 2013, pp. 139-144. J. Klotz, Z. Kan, J. M. Shea, E. Pasiliao, and W. E. Dixon, "Asymptotic Synchronization of Leader-Follower Networks of Uncertain Euler-Lagrange Systems," IEEE Conference on Decision and Control, Florence, IT, 2013, pp. 6536-6541. R. Kamalapurkar, P. Walters, and W. E. Dixon, "Concurrent learning-based approximate optimal regulation," IEEE Conference on Decision and Control, Florence, IT, 2013, pp. 6256-6261. T.-H. Cheng, R. Downey, and W. E. Dixon, "Robust output feedback control of uncertain switched Euler-Lagrange systems," IEEE Conference on Decision and Control, Florence, IT, 2013, pp. 4668-4673. R. Kamalapurkar, B. Bialy, L. Andrews, and W. E. Dixon, "Adaptive RISE Feedback Control Strategies for Systems with Structured and Unstructured Uncertainties," AIAA Guidance, Navigation, and Control Conference, Boston, MA, 2013. B. Bialy, L. Andrews, J. Curtis, and W. E. Dixon, "Saturated RISE Tracking Control of Store-Induced Limit Cycle Oscillations," AIAA Guidance, Navigation, and Control Conference, Boston, MA, 2013. Z. Kan, J. Klotz, E. L. Pasiliao, and W. E. Dixon, "Containment Control for a Directed Social Network with State-Dependent Connectivity," American Control Conference, Washington, DC, 2013, pp. 1953-1958. H. T. Dinh, N. Fischer, R. Kamalapurkar, W. E. Dixon "Output Feedback Control for Uncertain Nonlinear Systems with Slowly Varying Input Delay," American Control Conference, Washington, DC, 2013, pp. 1748-1753. R. Kamalapurkar, H. T. Dinh, P. Walters, W. E. Dixon "Approximate optimal cooperative decentralized control for consensus in a topological network of agents with uncertain nonlinear dynamics," American Control Conference, Washington, DC, 2013, pp. 1322-1327. B. Bialy, J. Klotz, K. Brink, W. E. Dixon "Lyapunov-Based Robust Adaptive Control of a Quadrotor UAV in the Presence of Modeling Uncertainties," American Control Conference, Washington, DC, 2013, pp. 13-18. S. Subramanian, J. W. Curtis, E. L. Pasiliao, J. M. Shea, and W. E. Dixon, "Continuous Congestion Control for Differentiated-Services Networks," IEEE Conference on Decision and Control, Maui, Hawaii, 2012, pp. 4591-4596. N. Fischer, R. Kamalapurkar, N. Sharma, and W. E. Dixon, "RISE-Based Control of an Uncertain Nonlinear System With Time-Varying State Delays," IEEE Conference on Decision and Control, Maui, Hawaii, 2012, pp. 3502-3507. K. Vamvoudakis, F. L. Lewis, M. Johnson, and W. E. Dixon, "Online Learning Algorithm for Stackelberg Games in Problems with Hierarchy," IEEE Conference on Decision and Control, Maui, Hawaii, 2012, pp. 1883-1889. D. Chwa, A. Dani, H. Kim, and W. E. Dixon, "Camera Motion Estimation for 3-D Structure Reconstruction of Moving Objects," IEEE International Conference on Systems, Man, and Cybernetics, Seoul, Korea, 2012, pp. 1788-1793. Z. Kan, E. L. Pasiliao, J. W. Curtis, and W. E. Dixon, "Particle Filter Based Average Consensus Target Tracking with Preservation of Network Connectivity," Military Communications Conference, Orlando, FL, 2012, pp. 760-765. S. Subramanian, E. L. Pasiliao, J. M. Shea, M. M. Carvalho, and W. Dixon, "Throughput Maximization in CSMA Networks with Collisions," Military Communications Conference, Orlando, FL, 2012, pp. 908-913. B. Bialy, C. Pasiliao, H. Dinh, and W. E. Dixon, "Lyapunov-Based Tracking of Store-Induced Limit Cycle Oscillations in an Aeroelastic System," ASME Dynamic Systems and Control Conference, Ft. Lauderdale, FL, 2012. Q. Wang, R. Kamalapurkar, R. Downey, and W. E. Dixon, "Hybrid Electrical Stimulation Tracking Control of the Ankle," ASME Dynamic Systems and Control Conference, Ft. Lauderdale, FL, 2012. O. Anubi, C. Crane, and W. E. Dixon, "Nonlinear Disturbance Rejection For Semi-active MacPherson Suspension System," ASME Dynamic Systems and Control Conference, Ft. Lauderdale, FL, 2012. C. Laplassotte, T.-H. Cheng, M. Bellman, W. E. Dixon, and B. Bayle, "Robotic Needle Insertion Into Viscoelastic Tissue," ASME Dynamic Systems and Control Conference, Ft. Lauderdale, FL, 2012. S. Jang, A. Dani, C. Crane, and W. E. Dixon, "Experimental Results for Moving Object Structure Estimation Using an Unknown Input Observer Approach," ASME Dynamic Systems and Control Conference, Ft. Lauderdale, FL, 2012. Q. Wang, H. Dinh, M. Bellman, and W. E. Dixon, "Acceleration Free Closed-loop Control of Neuromuscular Electrical Stimulation With An Uncertain Muscle Contraction Model," ASME Dynamic Systems and Control Conference, Ft. Lauderdale, FL, 2012. B. Bialy, J. Klotz, J. W. Curtis, and W. E. Dixon, "An Adaptive Backstepping Controller for a Hypersonic Air-Breathing Missile," AIAA Guidance Navigation and Control Conference, Minneapolis, Minnesota, 2012, to appear. R. Downey, E. Ambrosini, S. Ferrante, A. Pedrocchi, W. E. Dixon, and G. Ferrigno "Asynchronous Stimulation with an Electrode Array Reduces Muscle Fatigue during FES Cycling," International Functional Electrical Stimulation Society Conference, Banff, Canada, 2012, to appear. S. S. Mehta, E. L. Pasiliao, J. W. Curtis, P. Barooah, W. E. Dixon, "PEGUS: An Image-Based Robust Pose Estimation Method," 9th Conference on Computer and Robot Vision, Toronto, Canada, 2012, pp. 78-85. H. T. Dinh, S. Bhasin, D. Kim, and W. E. Dixon, "Dynamic Neural Network-based Global Output Feedback Tracking Control for Uncertain Second-Order Nonlinear Systems," American Control Conference, Montreal, Canada, 2012, pp. 6418-6423. N. Fischer, Z. Kan, and W. E. Dixon, "Saturated RISE Feedback Control for Euler-Lagrange Systems," American Control Conference, Montreal, Canada, 2012, pp. 244-249. N. Fischer, R. Kamalapurkar, N. Fitz-Coy, and W. E. Dixon, "Lyapunov-Based Control of an Uncertain Euler-Lagrange System with Time-Varying Input Delay," American Control Conference, Montreal, Canada, 2012, pp. 3919-3924. D. Kim, H. T. Dinh, W. MacKunis, N. Fitz-Coy, and W. E. Dixon, "A Recurrent Neural Network (RNN)-based Attitude Control Method for a VSCMG-actuated Satellite," American Control Conference, Montreal, Canada, 2012, pp. 944-949. Z. Kan, J. Klotz, T.-H. Cheng, and W. E. Dixon, "Ensuring Network Connectivity for Nonholonomic Robots During Decentralized Rendezvous," American Control Conference, Montreal, Canada, 2012, pp. 3718-3723. Z. Kan, J. M. Shea, and W. E. Dixon, "Influencing Emotional Behavior in a Social Network," American Control Conference, Montreal, Canada, 2012, pp. 4072-4077. L. Navaravong, J. M. Shea, E. L. Pasiliao Jr, and W. E. Dixon, "Optimizing Network Topology To Reduce Aggregate Traffic in A System of Mobile Robots under An Energy Constraint," Proc. IEEE Communications Conf., Ottawa, Canada, 2012, pp. 16-20. L. Navaravong, J. M. Shea, and W. E. Dixon, "Physical- and Network-Topology Control for Systems of Mobile Robots," Military Communincations Conference, Baltimore, MD, 2011, pp. 1079-1084. Z. Kan, A. Dani, J. M. Shea, and W. E. Dixon, "Ensuring Network Connectivity for Nonholonomic Robots During Rendezvous," IEEE Conference on Decision and Control, Orlando, FL, 2011, pp. 2369-2374. Z. Kan, A. Dani, J. Shea, and W. E. Dixon, "Information Flow Based Connectivity Maintenance of A Multi-agent System During Formation Control," IEEE Conference on Decision and Control, Orlando, FL, 2011, pp. 2375-2380. N. Fischer, A. Dani, N. Sharma, and W. E. Dixon, "Saturated Control of an Uncertain Euler-Lagrange System with Input Delay," IEEE Conference on Decision and Control, Orlando, FL, 2011, pp. 7587-7592. M. Johnson, S. Bhasin, and W. E. Dixon, "Nonlinear Two-player Zero-sum Game Approximate Solution Using a Policy Iteration Algorithm," IEEE Conference on Decision and Control, Orlando, FL, 2011, pp. 142-147. H. T. Dinh, R. Kamalapurkar, S. Bhasin, and W. E. Dixon, "Dynamic Neural Network-based Robust Observers for Second-order Uncertain Nonlinear Systems," IEEE Conference on Decision and Control, Orlando, FL, 2011, pp. 7543-7548. A. Dani, Z. Kan, N. Fischer, and W. E. Dixon, "Structure Estimation of a Moving Object Using a Moving Camera: An Unknown Input Observer Approach," IEEE Conference on Decision and Control, Orlando, FL, 2011, pp. 5005-5010. T. Hiramatsu, M. Johnson, N. Fitz-Coy, and W. E. Dixon, "Asymptotic Optimal Tracking Control for an Uncertain Nonlinear Euler-Lagrange System: A RISE-based Closed-Loop Stackelberg Game Approach," IEEE Conference on Decision and Control, Orlando, FL, 2011, pp. 1030-1035. D. Kim, H. T. Chung, S. Bhasin, and W. E. Dixon, "Robust Composite Adaptive Fuzzy Identification and Control for a Class of MIMO Nonlinear Systems," American Control Conference, San Francisco, CA, 2011, pp. 4947-4952. N. Fischer, S. Bhasin, and W. E. Dixon, "Nonlinear Control of an Autonomous Underwater Vehicle: A RISE-Based Approach," American Control Conference, San Francisco, CA, 2011, pp. 3972-3977. D. Kim, F. Leve, N. Fitz-Coy and W. E. Dixon, "Adaptive Attitude Control for a Small Satellite with Integrated Singularity Avoidance and Momentum Management," American Control Conference, San Francisco, CA, 2011, pp. 1015-1020. D. Kim, F. A. Leve, N. Fitz-Coy, and W. E. Dixon, "Integrated Power Reduction and Adaptive Attitude Control System of a VSCMG-Based Satellite," AAS/AIAA Space Flight Mechanics Meeting, New Orleans, LA, 2011, AAS-136, pp. 493-502. Q. Wang, N. Sharma, M. Johnson, and W. E. Dixon, "Asymptotic Optimal Control of Neuromuscular Electrical Stimulation," IEEE Conference on Decision and Control, Atlanta, GA, 2010, pp. 839-844. H. Dinh, S. Bhasin, and W. E. Dixon, "Dynamic Neural Network-based Robust Identification and Control of a class of nonlinear Systems," IEEE Conference on Decision and Control, Atlanta, GA, 2010, pp. 5536-5541. N. Sharma, S. Bhasin, Q. Wang, and W. E. Dixon, "RISE-Based Adaptive Control of an Uncertain Nonlinear System with Unknown State Delays," IEEE Conference on Decision and Control, Atlanta, GA, 2010, pp. 1773-1778. S. Bhasin, M. Johnson, and W. E. Dixon, "A model-free robust policy iteration algorithm for optimal control of nonlinear systems," IEEE Conference on Decision and Control, Atlanta, GA, 2010, pp. 3060-3065. J. Shin, H. Jin Kim, Y. Kim, and W. E. Dixon, "Asymptotic attitude tracking of the rotorcraft-based UAV via RISE feedback and NN feedforward," IEEE Conference on Decision and Control, Atlanta, GA, 2010, pp. 3694-3699. M. Johnson, T. Hiramatsu, N. Fitz-Coy, and W. E. Dixon, "Asymptotic Stackelberg Optimal Control Design for an Uncertain Euler Lagrange System," IEEE Conference on Decision and Control, Atlanta, GA, 2010, pp. 6686-6691. G. L. Barnette, J.M. Shea, and W. E. Dixon, "Using Kalman Innovations for Transmission Control of Location Updates in a Wireless Network," Military Communications Conference (MILCOM), San Jose, CA, 2010, pp. 2197-2202. Z. Kan, A. Dani, J.M. Shea, and W. E. Dixon, "Ensuring Network Connectivity During Formation Control Using A Decentralized Navigation Function," Military Communications Conference (MILCOM), San Jose, CA, 2010, pp. 954-959. Z. Kan, S. Subramanian, J.M. Shea, and W. E. Dixon, "Vision Based Connectivity Maintenance of a Network with Switching Topology," IEEE International Symposium on Intelligent Control part of the Multi-Conference on Systems and Control, Yokohama, Japan, September 2010, pp.1493-1498. Q. Wang, N. Sharma, M. Johnson, and W. E. Dixon, "Adaptive Inverse Optimal Neuromuscular Electrical Stimulation," IEEE International Symposium on Intelligent Control part of the Multi-Conference on Systems and Control, Yokohama, Japan, September 2010, pp. 1287-1292. G. Hu, F. D. Sahneh, and W. E. Dixon, "Robust Tracking Control of an Array of Nanoparticles Moving on a Substrate," IEEE International Symposium on Intelligent Control part of the Multi-Conference on Systems and Control, Yokohama, Japan, September 2010, pp. 2290-2295. A. Dani, K. El Rifai, and W. E. Dixon, "Globally Exponentially Convergent Observer for Vision-based Range Estimation," IEEE International Symposium on Intelligent Control part of the Multi-Conference on Systems and Control, Yokohama, Japan, September 2010, pp. 801-806. N. R. Gans, J. Shen, J. Shea, P. Barooah, W. Dixon, "Balancing Mission Requirement for Networked Autonomous Quadrotor Performing Video Reconnaissance," Proc. Society for Design and Process Science (SDPS) Transformative Systems Conference, Dallas, TX, 2010. S. Bhasin, P. Patre, Z. Kan, and W. E. Dixon, "Control of a Robot Interacting with an Uncertain Viscoelastic Environment with Adjustable Force Bounds," American Control Conference, Baltimore, MD, 2010, pp. 5242-5247. N. Sharma, S. Bhasin, Q. Wang, and W. E. Dixon, "Predictor-Based Control for an Uncertain Euler-Lagrange System with Input Delay," American Control Conference, Baltimore, MD, 2010, pp. 1422-1427. A. Dani, N. Fischer, Z. Kan, and W. E. Dixon, "Nonlinear Observer for Structure Estimation using a Paracatadioptric Camera," American Control Conference, Baltimore, MD, 2010, pp. 3487-3492. S. Bhasin, N. Sharma, P. Patre, and W. E. Dixon, "Robust Asymptotic Tracking of a Class of Nonlinear Systems using an Adaptive Critic Based Controller," American Control Conference, Baltimore, MD, 2010, pp. 3223-3228. A. Dani, Z. Kan, N. Fischer, and W. E. Dixon, "Structure and Motion Estimation of a Moving Object Using a Moving Camera," American Control Conference, Baltimore, MD, 2010, pp. 6962-6967. S. Subramanian, J. Shea, and W. E. Dixon, "Prediction-Based Power Control for Distributed Cellular Communication Networks with Time-Varying Channel Uncertainties," IEEE Conference on Decision and Control, Shanghai, China, 2009, pp. 1998-2003. D. Kim, W. Mackunis, N. Fitz-Coy, and W. E. Dixon, "Precision IPACS in the Presence of Dynamic Uncertainty," IEEE Conference on Decision and Control, Shanghai, China, 2009, pp. 5959-5964. M. Johnson, G. Hu, K. Dupree, and W. E. Dixon, "Inverse Optimal Homography-Based Visual Servo Control via an Uncalibrated Camera," IEEE Conference on Decision and Control, Shanghai, China, 2009, pp. 2408-2413. P. Patre, S. Bhasin, Z. Wilcox, and W. E. Dixon, "Composite Adaptation for Neural Network-Based Controllers," IEEE Conference on Decision and Control, Shanghai, China, 2009, pp. 6726-6731. S. Mehta, P. Barooah, S. Susca, and W. E. Dixon, "A Novel Algorithm for Refinement of Vision-based Two-View Pose Estimates," IEEE Conference on Decision and Control, Shanghai, China, 2009, pp. 8452-8457. W. MacKunis, Z. D. Wilcox, M. K. Kaiser, and W. E. Dixon, "Global Adaptive Output Feedback MRAC," IEEE Conference on Decision and Control, Shanghai, China, 2009, pp. 3483-3488. K. Dupree, P. M. Patre, M. Johnson, and W. E. Dixon, "Inverse Optimal Adaptive Control of a Nonlinear Euler-Lagrange System: Part I," IEEE Conference on Decision and Control, Shanghai, China, 2009, pp. 321-326. K. Dupree, M. Johnson, P. M. Patre, and W. E. Dixon, "Inverse Optimal Control of a Nonlinear Euler-Lagrange System, Part II: Output Feedback," IEEE Conference on Decision and Control, Shanghai, China, 2009, pp. 327-332. N. Sharma, P. Patre, C. Gregory, W. E. Dixon, "Nonlinear Control of NMES: Incorporating Fatigue and Calcium Dynamics," ASME Dynamic Systems and Control Conference, Hollywood, CA, 2009. R. A. Thompson, N. Rummelt, and W. E. Dixon, "Angular Rate Encoding in Haltere Feedback for Flight Stabilization of Dipteran Insects," AIAA Guidance, Navigation, & Control Conference, Chicago, IL, 2009. N. Gans, W. Curtis, P. Barooah, J. Shea, and W. E. Dixon, "Balancing Mission Requirement for Networked Autonomous Rotorcrafts Performing Video Reconnaissance," AIAA Guidance, Navigation, & Control Conference, Chicago, IL, 2009. Z. D. Wilcox, S. Bhat, R. Lind, W. E. Dixon, "Control Performance Variation due to Nonlinear Aerothermoelasticity in a Hypersonic Vehicle: Insights for Structural Design," AIAA Guidance, Navigation, & Control Conference, Chicago, IL, 2009. W. E. Dixon, C. Crane, R. Kress, and F. Bzorgi "Motion Estimation for Improved Target Tracking with a Network of Cameras," ANS Annual Meeting, Atlanta, GA, 2009. P. M. Patre, W. MacKunis, M. Johnson, and W. E. Dixon, "Composite Adaptive Control for Systems with Additive Disturbances," Proceedings of American Control Conference, St. Louis, Missouri, 2009, pp. 1928-1933. K. Dupree, P. M. Patre, Z. D. Wilcox, and W. E. Dixon, "Optimal Control of Uncertain Nonlinear Systems using a Neural Network and RISE Feedback," Proceedings of American Control Conference, St. Louis, Missouri, 2009, pp. 361-366. S. Subramanian, J.M. Shea, W. E. Dixon, "Power Control for Cellular Communications with Channel Uncertainties," Proceedings of American Control Conference, St. Louis, Missouri, 2009, pp. 1569-1574. Z. D. Wilcox, W. Mackunis, S. Bhat, R. Lind, W. E. Dixon, "Robust Nonlinear Control of a Hypersonic Aircraft in the Presence of Aerothermoelastic Effects," Proceedings of American Control Conference, St. Louis, Missouri, 2009, pp. 2533-2538. S. Bhasin, K. Dupree, Z. D. Wilcox, and W. E. Dixon, "Adaptive Control of a Robotic System Undergoing a Non-Contact to Contact Transition with a Viscoelastic Environment," Proceedings of American Control Conference, St. Louis, Missouri, 2009, pp. 3506-3511. A.P. Dani, N.R. Gans, W. E. Dixon, "Position-Based Visual Servo Control of Leader-Follower Formation Using Image-Based Relative Pose and Relative Velocity Estimation," Proceedings of American Control Conference, St. Louis, Missouri, 2009, pp. 5271-5276. N. R. Gans, G. Hu and W. E. Dixon, "Keeping Multiple Objects in the Field of View of a Single PTZ Camera," Proceedings of American Control Conference, St. Louis, Missouri, 2009, pp. 5259-5264. G. Barnette, J. Shea, and W. E. Dixon, "Sensing and Control in a Bandwidth-Limited Systems: A Kalman Filter Approach," Military Communications Conference (MILCOM), San Diego, CA, 2008. N. R. Gans, J. Shea, P. Barooah, and W. E. Dixon, "Ensuring Network Connectivity of UAV's Performing Video Reconnaissance," Military Communications Conference (MILCOM), San Diego, CA, 2008. K. Dupree, P. Patre, Z. Wilcox, W. E. Dixon, "Optimal Control of Uncertain Nonlinear Systems using RISE Feedback," IEEE Conference on Decision and Control, Cancun, Mexico, pp. 2154 - 2159, 2008. S. Bhasin, K. Dupree, P. Patre, W. E. Dixon, "Neural Network Control of a Robot Interacting with an Uncertain Hunt-Crossley Viscoelastic Environment," ASME Dynamic Systems and Control Conference, Ann Arbor, Michigan, September 2008. N. R. Gans, G. Hu, W. E. Dixon, "Simultaneous Stability of Image and Pose Error in Visual Servo Control," IEEE International Symposium on Intelligent Control, San Antonio, Texas, September 2008, pp. 438-443. N. R. Gans, G. Hu, W. E. Dixon, "Keeping Objects in the Field of View: An Underdetermined Task Function Approach to Visual Servoing," IEEE International Symposium on Intelligent Control part of the Multi-Conference on Systems and Control, San Antonio, Texas, September 2008, pp. 432-437 . N. Sharma, C. M. Gregory, M. Johnson and W. E. Dixon, "Modified Neural Network-based Electrical Stimulation for Human Limb Tracking," IEEE International Symposium on Intelligent Control part of the Multi-Conference on Systems and Control, San Antonio, Texas, September 2008, pp. 1320-1325 (Finalist for Best Student Paper Award). A. P. Dani, S. Velat, C. Crane, N. R. Gans and W. E. Dixon, "Experimental Results for an Image-Based Pose and Velocity Estimation Method," IEEE International Conference on Control Applications part of the Multi-Conference on Systems and Control, San Antonio, Texas, September 2008, pp. 1159-1164. W. MacKunis, M. K. Kaiser, P. M. Patre, and W. E. Dixon, "Adaptive Dynamic Inversion for Asymptotic Tracking of an Aircraft Reference Model," AIAA Guidance, Navigation and Control Conference and Exhibit, Honolulu, Hawaii, August 2008. R. A. Thompson, M. F. Wehling, J. Evers, and W. E. Dixon, "Evaluation of the Haltere as a Biologically Inspired Inertial Rate Measurement Sensor," AIAA Guidance, Navigation and Control Conference and Exhibit, Honolulu, Hawaii, August 2008. S. S. Mehta, G. Hu, A. P. Dani, W. E. Dixon, "Multi-Reference Visual Servo Control of an Unmanned Ground Vehicle," AIAA Guidance, Navigation and Control Conference and Exhibit, Honolulu, Hawaii, August 2008. G. Hu, W. MacKunis, N. Gans, and W. E. Dixon, "Adaptive Homography-Based Visual Servo Control via an Uncalibrated Camera," Proceedings of the American Control Conference, 2008, Seattle, WA, USA, pp. 4791-4796. N. R. Gans, A. Dani, W. E. Dixon, "Visual Servoing to an Arbitrary Pose with Respect to an Object Given a Single Known Length," Proceedings of the American Control Conference, 2008, Seattle, WA, USA, pp. 1261-1267. K. Stegath, N. Sharma, C. M. Gregory, and W. E. Dixon, "Nonlinear Tracking Control of a Human Limb via Neuromuscular Electrical Stimulation," Proceedings of the American Control Conference, 2008, Seattle, WA, USA, pp. 1941-1946 (O. Hugo Schuck Award). P. M. Patre, W. MacKunis, K. Dupree, and W. E. Dixon, "A New Class of Modular Adaptive Controllers, Part I: Systems with Linear-in-the-Parameters Uncertainty," Proceedings of the American Control Conference, 2008, Seattle, WA, USA, pp. 1208-1213. P. M. Patre, K. Dupree, W. MacKunis, and W. E. Dixon, "A New Class of Modular Adaptive Controllers, Part II: Neural Network Extension for Non-LP Systems," Proceedings of the American Control Conference, 2008, Seattle, WA, USA, pp. 1214-1219. W. MacKunis, K. Kaiser, P. M. Patre, and W. E. Dixon, "Asymptotic Tracking for Aircraft via an Uncertain Dynamic Inversion Method," Proceedings of the American Control Conference, 2008, Seattle, WA, USA, pp. 3482-3487. W. MacKunis, K. Dupree, N. Fitz-Coy, and W. E. Dixon, "Adaptive Neural Network Satellite Attitude Control in the Presence of Inertia and CMG Actuator Uncertainties," Proceedings of the American Control Conference, 2008, Seattle, WA, USA, pp. 2975-2980. K. Dupree, S. Mehta, C. Crane and W. E. Dixon, "Euclidean Calculation of the Pose of an Unmanned Ground Vehicle: A Daisy Chaining Approach," International Joint Topical Meeting on Emergency Preparedness & Response and Robotics & Remote Systems, Albuquerque, New Mexico, 2008, pp. 557-562. C. Gregory, C. S. Bickel, K. Stegath, and W. E. Dixon, "The Impact of Varying Stimulation Intensity and Contraction Type on the Force-Frequency Relationship in Human Skeletal Muscle During NMES,"�American Physical Therapy Association-Combined Sections Meeting, �Nashville, TN , 2008. R. S. Causey, S. S. Mehta, R. Lind, and W. E. Dixon, "Dynamic Target State Estimation for Autonomous Aerial Vehicles using a Monocular Camera System," SAE AeroTech Congress & Exhibition, pp. 2007-01-3844, Los Angeles, CA, 2007. C. Liang, S. Bhasin, K. Dupree, and W. E. Dixon, "An Impact Force Limiting Adaptive Controller for a Robotic System Undergoing a Non-Contact to Contact Transition," Proceedings of the IEEE Conference on Decision and Controls, New Orleans, LA, 2007, pp. 3555-3560. K. Stegath, N. Sharma, C.M. Gregory, and W. E. Dixon, "Experimental Demonstration of RISE-Based NMES of Human Quadriceps Muscle," IEEE-NIH Life Science Systems and Applications (LISSA'07) workshop, Bethesda, MD. K. Stegath, N. Sharma, C.M. Gregory, and W. E. Dixon, "An Extremum Seeking Method for Non-isometric Neuromuscular Electrical Stimulation," IEEE International Conference on Systems, Man and Cybernetics, Montreal, Canada, 2007, pp. 2528-2532. W. MacKunis, N. Gans, K. Kaiser, and W. E. Dixon, "Unified Tracking and Regulation Visual Servo Control for Wheeled Mobile Robots," IEEE Multi-Conference on Systems and Control, October 2007, Suntec City, Singapore, pp. 88-93. G. Hu and W. E. Dixon "Lyapunov-Based Adaptive Visual Servo Tracking Control Using Central Catadioptric Camera," IEEE Multi-Conference on Systems and Control, October 2007, Suntec City, Singapore, pp. 1486-1491. G. Hu, N. R. Gans, and W. E. Dixon, "Quaternion-Based Visual Servo Control in the Presence of Camera Calibration Error," IEEE Multi-Conference on Systems and Control, October 2007, Suntec City, Singapore, pp. 1492-1497. G. Hu, S. Mehta, N. Gans, and W. E. Dixon, "Daisy Chaining Based Visual Servo Control Part I: Adaptive Quaternion-Based Tracking Control," IEEE Multi-Conference on Systems and Control, October 2007, Suntec City, Singapore, pp. 1474-1479. G. Hu, N. Gans, S. Mehta, and W. E. Dixon, "Daisy Chaining Based Visual Servo Control Part II: Extensions, Applications and Open Problems," IEEE Multi-Conference on Systems and Control, October 2007, Suntec City, Singapore, pp. 729-734. L. Ma, C. Cao, N. Hovakimyan, W. E. Dixon, C. Woolsey, "Fast Estimation for Range Identification in the Presence of Unknown Motion Parameters," International Conference on Informatics in Control, Automation and Robotics (ICINCO), May 2007, Angers, France, 157-164. W. MacKunis, K. Dupree, N. Fitz-Coy, and W. E. Dixon "Adaptive Satellite Attitude Control in the Presence of Inertia and CMG Gimbal Friction Uncertainties," AIAA Conference on Guidance Navigation and Control, August 2007, Hilton Head, SC. P. Patre, W. E. Dixon, K. Kaiser, W. Mackunis, "Asymptotic Tracking for Uncertain Dynamic Systems via a Multilayer NN Feedforward and RISE Feedback Control Structure," American Control Conference, July 2007, New York, NY, pp. 5989-5994. K. Dupree, N. Gans, W. Mackunis, W. E. Dixon, "Euclidean Calculation of Feature Points of a Rotating Satellite: A Daisy Chaining Approach," American Control Conference, July 2007, New York, NY, pp. 3874-3879. L. Ma, C. Cao, N. Hovakimyan, W. E. Dixon, C. Woolsey, "Range Identification in the Presence of Unknown Motion Parameters for Perspective Vision Systems," American Control Conference, July 2007, New York, NY, pp. 972-977. K. Kaiser, N. R. Gans, W. E. Dixon, "Localization and Control of an Aerial Vehicle through Chained, Vision-Based Pose Reconstruction," American Control Conference, July 2007, New York, NY, pp. 5934-5939. S. C. Solanki, W. E. Dixon, C. D. Crane, and S. Gupta, "Uncalibrated Visual Servo Control of Robot Manipulators with Uncertain Kinematics," IEEE Conference on Decision and Control, San Diego, California, 2006, pp. 3855-3860. S. Mehta, G. Hu, N. Gans, and W. E. Dixon, "Adaptive Vision-Based Collaborative Tracking Control of an UGV via a Moving Airborne Camera: A Daisy Chaining Approach," IEEE Conference on Decision and Control, San Diego, California, 2006, pp. 3867-3872. K. Dupree, C.-H. Liang, G. Hu, W. E. Dixon, "Global Adaptive Lyapunov-Based Control of a Robot and Mass-Spring System Undergoing An Impact Collision," IEEE Conference on Decision and Control, San Diego, California, 2006, pp. 2039-2044. D. Aiken, S. Gupta, G. Hu, W. E. Dixon, "Lyapunov-Based Range Identification for a Paracatadioptric System," IEEE Conference on Decision and Control, San Diego, California, 2006, pp. 3879-3884. G. Hu, S. Gupta, N. Fitz-coy, and W. E. Dixon, "Lyapunov-Based Visual Servo Tracking Control via a Quaternion Formulation," IEEE Conference on Decision and Control, San Diego, California, 2006, pp. 3861-3866. P. M. Patre, W. E. Dixon, C. Makkar, and W. Mackunis, "Asymptotic Tracking for Systems with Structured and Unstructured Uncertainties," IEEE Conference on Decision and Control, San Diego, California, 2006, pp 441-446. S. Mehta, K. Kaiser, N. Gans, W. E. Dixon, "Homography-Based Coordinate Relationships for Unmanned Air Vehicle Regulation," Proceedings of AIAA Guidance, Navigation, and Control Conference, Keystone, Colorado, 2006. K. Kaiser, N. Gans, S. Mehta, W. E. Dixon, "Position and Orientation of an Aerial Vehicle through Chained, Vision-Based Pose Reconstruction," Proceedings of AIAA Guidance, Navigation, and Control Conference, Keystone, Colorado, 2006. S. Mehta, W. E. Dixon, D. MacArthur, C. D. Crane, "Visual Servo Control of an Unmanned Ground Vehicle via a Moving Airborne Monocular Camera," American Control Conference, Minneapolis, Minnesota, 2006, pp. 5276-5281. S. Gupta, D. Aiken, G. Hu, W .E. Dixon, "Lyapunov-Based Range and Motion Identification for a Nonaffine Perspective Dynamic System," American Control Conference, Minneapolis, Minnesota, 2006, pp. 4471-4476. K. Dupree, W. E. Dixon, G. Q. Hu, and C.-H. Liang, "Lyapunov-Based Control of a Robot and Mass-Spring System Undergoing An Impact Collision," American Control Conference, Minneapolis, Minnesota, 2006, pp. 3241-3246. G. Hu, W. E. Dixon, S. Gupta, and N. Fitz-Coy, "A Quaternion Formulation for Homography-based Visual Servo Control," IEEE International Conference on Robotics and Automation, Orlando, Florida, 2006, pp. 2391-2396. D. Braganza, W. E. Dixon, D. M. Dawson, B. Xian, "Tracking Control for Robot Manipulators with Kinematic and Dynamic Uncertainty," IEEE Conference on Decision and Control, Seville, Spain, 2005, pp. 5293-5297. G. Q. Hu, W. E. Dixon, C. Makkar, "Energy-Based Nonlinear Control of Underactuated Euler-Lagrange Systems Subject to Impacts," IEEE Conference on Decision and Control, Seville, Spain, 2005, pp. 6859-6864. S. Mehta, W. E. Dixon, T. Burks, and S. Gupta, "Lyapunov-Based Teach By Zooming Visual Servo Control for an Uncalibrated Camera System," Proceedings of the AIAA Guidance Navigation and Control Conference, San Francisco, CA, 2005. C. Makkar, W. E. Dixon, W. G. Sawyer, and G.Hu, "A New Continuously Differentiable Friction Model for Control Systems Design," IEEE/ASME International Conference on Advanced Intelligent Mechatronics, Monterey, CA, 2005, pp. 600-605. J. Chen, W. E. Dixon, D. M. Dawson, and T. Galluzzo, "Navigation and Control of a Wheeled Mobile Robot," IEEE/ASME International Conference on Advanced Intelligent Mechatronics, Monterey, CA, 2005, pp. 1145-1150. J.-H. Lee, W. E. Dixon, J. C. Ziegert, C. Makkar, "Adaptive Nonlinear Contour Coupling Control for a Machine Tool System," IEEE/ASME International Conference on Advanced Intelligent Mechatronics, Monterey, CA, 2005, pp. 1629-1634. M. McIntyre, W. E. Dixon, D. Dawson, and E. Tatlicioglu, "Passive Coordination of Nonlinear Bilateral Teleoperated Manipulators," IEEE/ASME International Conference on Advanced Intelligent Mechatronics, Monterey, CA, 2005, pp. 1287-1292. W. Dixon, T. Galluzzo, G. Hu, and C. Crane, "Velocity Field Control of a Wheeled Mobile Robot," Fifth International Workshop on Robot Motion and Control, Dymaczewo, Poland, 2005, pp. 145-150. C. Makkar, W. E. Dixon, W. G. Sawyer, G. Hu, "Lyapunov-Based Tracking Control in the Presence of Uncertain Nonlinear Parameterizable Friction," Proceedings of the American Control Conference, Portland, Oregon, 2005, pp. 1975-1980. V. Chitrakaran, D. M. Dawson, J. Chen, and W. E. Dixon, "Structure From Motion: A Lyapunov-Based Nonlinear Estimation Approach," Proceedings of the American Control Conference, Portland, Oregon, 2005, pp. 4601-4606. J. Chen, D. M. Dawson, W. E. Dixon, and V. Chitrakaran, "Navigation Function Based Visual Servo Control," Proceedings of the American Control Conference, Portland, Oregon, 2005, pp. 3682-3687. M. McIntyre, W. E. Dixon, D. M. Dawson, and B. Xian, "Adaptive Tracking Control of On-Line Path Planners: Velocity Fields and Navigation Functions," Proceedings of the American Control Conference, Portland, Oregon, 2005, pp. 3168-3173. J. Chen, D. M. Dawson, W. E. Dixon, and V. Chitrakaran, "An Optimization-Based Approach for Fusing Image-Based Trajectory Generation with Position-Based Visual Servo Control," Proceedings of the IEEE Conference on Decision and Control, Paradise Island, Bahamas, December 14-17, 2004, pp. 4034-4039. X. T. Zhang, D. M. Dawson, W. E. Dixon, and B. Xian, "Extremum Seeking Nonlinear Controllers for a Human Exercise Machine," Proceedings of the IEEE Conference on Decision and Control, Paradise Island, Bahamas, December 14-17, 2004, pp. 3950-3955. J. Chen, W. E. Dixon, D. M. Dawson, and V. Chitrakaran, "Visual Servo Tracking Control of a Wheeled Mobile Robot with a Monocular Fixed Camera," Proceedings of the IEEE Conference on Control Applications, Taipei, Taiwan, 2004, to appear. Y. Fang, W. E. Dixon, and D. M. Dawson,"Adaptive 2.5D Visual Servoing of Cartesian Robots," Proceedings of the International Conference on Control, Automation, Robotics and Vision, (ICARCV), Kunming, China, December 6-9, 2004, pp. 68-73. X. T. Zhang, D. M. Dawson, W. E. Dixon, and B. Xian, "Experimental Demonstration of an Actuated Exercise Machine," Proceedings of the IEEE International Engineering in Medicine and Biology Conference, San Francisco, CA, September 1-5, 2004, pp. 2707-2710. M. McIntyre, W. E. Dixon, D. M. Dawson, and I. D. Walker, "Fault Detection and Identification for Robot Manipulators," Proceedings of the IEEE International Conference Robotics and Automation, New Orleans, Louisiana, April 2004, pp. 4981-4986. D. Pazderski, K. Kozlowski, and W. E. Dixon, "Tracking and Regulation Control of a Skid-Steering Vehicle," ANS International Conference on Robotics and Remote Systems for Hazardous Environments, Gainesville, Florida, March 28-April 1, 2004, pp. 369-376. W. E. Dixon, "Adaptive Regulation of Amplitude Limited Robot Manipulators with Uncertain Kinematics and Dynamics," Proceedings of the American Control Conference, Boston, Massachusetts, June 30-July 2, 2004, pp. 3839 - 3844. M. W. Noakes and W. E. Dixon, "Ergonomic Interface Concepts for Minimally Invasive, Remote, and Virtual Surgical Systems," 12th Annual Medicine Meets Virtual Reality Conference, Newport Beach, California, January 15 - 17, 2004, pp. 275-277. D. L. Jung, W. E. Dixon, and F. G. Pin, "Automated Kinematic Generator for Surgical Robotic Systems," 12th Annual Medicine Meets Virtual Reality Conference, Newport Beach, California, January 15-17, 2004, pp. 144-146. W. E. Dixon, "Teach by Zooming: A Camera Independent Alternative to Teach By Showing Visual Servo Control," Proceedings of the 2003 IEEE International Conference on Intelligent Robots and Systems, Las Vegas, Nevada, October 2003, pp. 749-754. J. Chen, D. M. Dawson, W. E. Dixon, and A. Behal, "Adaptive Homography-Based Visual Servo Tracking," Proceedings of the IEEE International Conference on Intelligent Robots and Systems, Las Vegas, Nevada, October 2003, pp. 230-235. J. Chen, W. E. Dixon, D. M. Dawson, and M. McIntire, "Homography-Based Visual Servo Tracking Control of a Wheeled Mobile Robot," Proceedings of the IEEE International Conference on Intelligent Robots and Systems, Las Vegas, Nevada, October 2003, pp. 1814-1819. Y. Fang, W. E. Dixon, D. M. Dawson, and J. Chen, "An Exponential Class of Model-Free Visual Servoing Controllers in the Presence of Uncertain Camera Calibration," Proceedings of the IEEE Conference on Decision and Control, Maui, Hawaii USA, December, 2003, pp. 5390-5395. V. Chitrakaran, D. M. Dawson, W. E. Dixon, and J. Chen, "Identification of a Moving Object's Velocity with a Fixed Camera," Proceedings of the IEEE Conference on Decision and Control, Maui, Hawaii USA, December, 2003, pp. 5402-5407. J. Chen, A. Behal, D. M. Dawson, and W. E. Dixon, "Adaptive Visual Servoing in the Presence of Intrinsic Calibration Uncertainty," Proceedings of the IEEE Conference on Decision and Control, Maui, Hawaii USA, December 2003, pp. 5396-5401. W. E. Dixon, Y. Fang, D. M. Dawson, and J. Chen, "Adaptive Range Identification for Exponential Visual Servo Control," Proceedings of the IEEE International Symposium on Intelligent Control, Houston, Texas, October 2003, pp. 46-51. W. E. Dixon, Y. Fang, D. M. Dawson, and T. J. Flynn, "Range Identification for Perspective Vision Systems," Proceedings of the IEEE American Control Conference, Denver, Colorado, June 2003, pp. 3448-3453. Y. Fang, W. E. Dixon, D. M. Dawson, and J. Chen, "Robust 2.5D Visual Servoing for Robot Manipulators," Proceedings of the IEEE American Control Conference, Denver, Colorado, June 2003, pp. 3311-3316. Y. Fang, A. Behal, W. E. Dixon, and D. M. Dawson, "Adaptive 2.5D Visual Servoing of Kinematically Redundant Robot Manipulators," Proceedings of the IEEE Conference on Decision and Control, Las Vegas, Nevada, December 2002, pp. 2860-2865. Y. Fang, D. M. Dawson, W. E. Dixon, and M. S. de Queiroz, "Homography-based Visual Servoing of Wheeled Mobile Robots," Proceedings of the IEEE Conference on Decision and Control, Las Vegas, Nevada, December 2002, pp. 2866-2871. J. Chen, W. E. Dixon, J. R. Wagner, and D. M. Dawson, "Exponential Tracking Control of a Hydraulic Proportional Directional Valve and Cylinder via Integrator Backstepping," Proceedings of the ASME International Mechanical Engineering Congress and Exposition, November 2002. W. E. Dixon and L. J. Love, "Lyapunov-based Visual Servo Control for Robotic Deactivation and Decommissioning," Proceedings of the Biennial ANS International Spectrum Conference, Reno, Nevada, August 2002. W. E. Dixon , M. S. de Queiroz, and D. M. Dawson, "Adaptive Tracking and Regulation Control of a Wheeled Mobile Robot with Controller/Update Law Modularity," Proceedings of the IEEE International Conference on Robotics and Automation, Washington, DC, May 2002, pp. 2620-2625. V. K. Varma and W. E. Dixon, "Design of a Piezoelectric Meso-Scale Mobile Robot: A Compliant Amplification Approach," Proceedings of the IEEE International Conference on Robotics and Automation, Washington, DC, May 2002, pp. 1137-1142. W. E. Dixon, E. Zergeroglu, Y. Fang, and D. M. Dawson, "Object Tracking by a Robot Manipulator: A Robust Cooperative Visual Servoing Approach," Proceedings of the IEEE International Conference on Robotics and Automation, Washington, DC, May 2002, pp. 211-216. Y. Fang, W. E. Dixon, D. M. Dawson, and E. Zergeroglu, "Nonlinear Coupling Control Laws for a 3-DOF Overhead Crane System," Proceedings of the IEEE Conference on Decision and Control, Dec. 2001, pp. 3766-3771. W. E. Dixon, D. Moses, I. D. Walker, and D. M. Dawson, "A Simulink-Based Robotic Toolkit for Simulation and Control of the PUMA 560 Robot Manipulator," Proceedings of the IEEE/RSJ International Conference on Intelligent Robots and Systems (IROS), Maui, HI, November 2001, pp. 2202-2207. Y. Fang, E. Zergeroglu, W. E. Dixon, and D. M. Dawson, "Nonlinear Coupling Control Laws for an Overhead Crane System," Proceedings of the IEEE Conference on Control Applications, Mexico City, Mexico, September 2001, pp. 639-644. W. E. Dixon, E. Zergeroglu, D. Dawson, and B. T. Costic, "Repetitive Learning Control: A Lyapunov-Based Approach," Proceedings of the IEEE Conference on Control Applications, Mexico City, Mexico, September 2001, pp. 530-535. W. E. Dixon, I. D. Walker, and D. M. Dawson, "Fault Detection for Wheeled Mobile Robots with Parametric Uncertainty," Proceedings of the IEEE/ASME International Conference on Advanced Intelligent Mechatronics, Como, Italy, July 2001, pp. 1245-1250. W. E. Dixon, D. M. Dawson, B. T. Costic, and M. S. de Queiroz, "Towards the Standardization of a MATLAB-Based Control Systems Laboratory Experience for Undergraduate Students," Proceedings of the American Control Conference, Arlington, Virginia, June 2001, pp. 1161-1166. P. Setlur, A. Behal, W. E. Dixon, and D. M. Dawson, "Adaptive Position and Orientation Regulation for the Camera-in-Hand Problem," Proceedings of the International Symposium on Adaptive and Intelligent Systems and Control, 2001. A. Behal, W.E. Dixon, D. M. Dawson, and Y. Fang, "Tracking and Regulation Control of an Underactuated Surface Vessel with Nonintegrable Dynamics," Proceedings of the IEEE Conference on Decision and Control, Sydney, Australia, December 2000, pp. 2150-2155. W. E. Dixon, D. M. Dawson, and E. Zergeroglu, "Robust Control of a Mobile Robot System with Kinematic Disturbances," Proceedings of the IEEE International Conference on Control Applications, Anchorage, Alaska, September 2000, pp. 437-442. W. E. Dixon, D. M. Dawson, E. Zergeroglu, and A. Behal, "Adaptive Tracking Control of a Wheeled Mobile Robot via an Uncalibrated Camera System," Proceedings of the American Control Conference, Chicago, Illinois, June 2000, pp. 1493-1497. W. E. Dixon, I. D. Walker, D. M. Dawson, and J. P. Hartranft, "Fault Detection for Robotic Manipulators with Parametric Uncertainty: A Prediction Error Based Approach," Proceedings of the IEEE International Conference on Robotics and Automation, San Francisco, California, April 2000, pp. 3628-3634. W. E. Dixon, D. M. Dawson, F. Zhang, and E. Zergeroglu, "Global Exponential Tracking Control of A Mobile Robot System via a PE Condition," Proceedings of the IEEE Conference on Decision and Control, Phoenix, Arizona, December 1999, pp. 4822-4827. M. Feemster, D. M. Dawson, A. Behal, and W. E. Dixon, "Tracking Control in the Presence of Nonlinear Dynamic Frictional Effects: Robot Extension," Proceedings of the IEEE Conference on Control Applications, Kohala Coast, Hawaii, pp. 1169-1174, 1999. W. E. Dixon, D. M. Dawson, E. Zergeroglu, and F. Zhang, "Robust Tracking Control of a Mobile Robot System," Proceedings of the IEEE International Conference on Control Applications, Kohala Coast, Hawaii, August 1999, pp. 1015-1020. W. E. Dixon, E. Zergeroglu, D. M. Dawson, and M. W. Hannan, "Global Adaptive Partial State Feedback Tracking Control of Rigid-Link Flexible-Joint Robots," Proceedings of the IEEE/ASME International Conference on Advanced Intelligent Mechatronics, Atlanta, Georgia, September 1999, pp. 281-286. W. E. Dixon, E. Zergeroglu, D. M. Dawson, and M. W. Hannan, "Experimental Video of a Controller for Flexible Joint Robots," Video Proceedings of the IEEE/ASME International Conference on Advanced Intelligent Mechatronics, Atlanta, Georgia, September 1999. W. E. Dixon, D. M. Dawson, F. Zhang, and E. Zergeroglu, "Global Exponential Setpoint Control of Mobile Robots," Proceedings of the IEEE/ASME International Conference on Advanced Intelligent Mechatronics, Atlanta, Georgia, September 1999, pp. 683-688. E. Zergeroglu, W. E. Dixon, A. Behal, and D. M. Dawson, "Composite Adaptive Output Feedback Tracking Control of Robotic Manipulators," Proceedings of the American Control Conference, San Diego, California, June 1999, pp. 3013-3017. W. E. Dixon, F. Zhang, D. M. Dawson, and A. Behal, "Global Robust Output Feedback Tracking Control of Robot Manipulators," Proceedings of the IEEE International Conference on Control Applications, Trieste, Italy, September 1998, pp. 897-901. E. Zergeroglu, W. E. Dixon, D. M. Dawson, and M. W. Hannan, "Lyapunov-Based Set-Point Control of the Acrobot," Proceedings of the IEEE International Conference on Control Applications, Trieste, Italy, September 1998, pp. 887-891. W. E. Dixon, M. S. de Queiroz, D. M. Dawson, and F. Zhang, "Tracking Control of Robot Manipulators with Bounded Torque Inputs" Proceedings of the IASTED International Conference on Robotics and Manufacturing, Banff, Canada, July 1998, pp.112-115. W. E. Dixon, E. Zergeroglu, D. M. Dawson, and M. S. de Queiroz, "Global Output Feedback Tracking Control for Rigid-Link Flexible-Joint Robots," Proceedings of the IEEE International Conference on Robotics and Automation, Leuven, Belgium, May 1998, pp. 498-504. F. Zhang, D. M. Dawson, M. S. de Queiroz, and W. E. Dixon, "Global Adaptive Output Feedback Tracking Control of Robot Manipulators," Proceedings of the IEEE Conference on Decision and Control, San Diego, California, December 1997, pp. 3634-3639. P. V. Chawda, W. E. Dixon, T. J. Flynn, E. B. Holcombe, L. J. Love, J. C. Rowe, "Proof-of-Concept Demonstration Results for Robotic Visual Servo Controllers," Oak Ridge National Laboratory Technical Manual ORNL/TM-2004/110, 2004. K. Fischer, D. Jung, A. Cordero, W. E. Dixon, F. Pin, "JFKengine: A Jacobian and Forward Kinematics Generator," Oak Ridge National Laboratory Technical Manual ORNL/TM-2002/230, 2002. © University of Florida, Gainesville, FL 32611; (352) 656-5924.